连续葡萄糖监测系统可包括手持监测器、发射机、胰岛素泵和正交冗余葡萄糖传感器，其可包括光学葡萄糖传感器和非光学葡萄糖传感器。 Continuous glucose monitoring system may include a hand-held monitor, a transmitter, an insulin pump and orthogonal redundancy glucose sensor, glucose sensor which may include optical and non-optical glucose sensor. 前者可以是光纤传感器，包括具有葡萄糖类似物和用荧光团标记的葡萄糖受体的竞争性葡萄糖结合亲合力试样，其被光学询问系统例如堆叠平面集成光学系统询问。 The former may be a fiber optic sensor, comprising a glucose analogue labeled with a fluorophore and a glucose receptor competitive binding affinity for glucose samples, which are stacked planar optical interrogation systems such as integrated optical systems interrogation. 非光学传感器可以是电化学传感器，其具有沿着其长度布置的多个电极。 Non-optical sensor may be an electrochemical sensor having a plurality of electrodes disposed along its length. 光学和电化学传感器的近侧部分可容纳在发射机内部并与用于例如接收来自传感器的信号、转换成相应的葡萄糖值并传递葡萄糖值的仪器操作性地耦合。 The proximal portion of optical and electrochemical sensors may be housed in the interior of the transmitter and receive signals from a sensor, for example, and for the conversion into the corresponding glucose value and instrument is operatively coupled to transfer glucose value. 传感器的远侧部分可经由单个输送针头插入用户的身体内，并可被协同定位在用户的身体内部。 The distal portion of the sensor may be conveyed via a single needle inserted into the body of the user, and may be co-located in the interior of the user's body. 本申请要求2011年9月6日提交的美国临时申请序列号61/531449和2011年9 月6日提交的美国临时申请序列号61/531451和2011年9月6日提交的美国临时申请序列号61/531456和2011年11月1日提交的美国临时申请序列号61/554057和2011年11 月17日提交的美国临时申请序列号61/561146和2012年1月18日提交的美国临时申请序列号61/587819和2012年4月5日提交的美国临时申请序列号61/620563的优先权，并与和本申请同时提交的代理档案号为040088-0405702的标题为"Optical Sensor Systems and Methods"的美国专利申请有关，所有这些申请都通过引用被全部并入本文。  This application claims the US US Provisional Application Serial No. 61/531449 and US Provisional Application Serial No. September 6, 2011, filed September 6, 2011 and 61/531451 filed on September 6, 2011 filed provisional application serial No. 61/531456 and US provisional application serial number November 1, 2011 and 61/554057 filed filed US provisional application serial No. 61/561146 November 17th, 2011 and filed January 18, 2012 United States provisional application serial No. 61/587819 priority of US provisional application serial No. 61/620563 and 2012 filed April 5, with Attorney Docket No. and filed concurrently filed 040088-0405702 entitled "Optical Sensor Systems and Methods "US patent application related to all of these applications are incorporated herein by reference. 本发明的实施例通常涉及传感器技术，包括用于感测各种生理参数例如葡萄糖浓度的传感器。 Example  The present invention generally relates to sensor technology, comprising a sensor to sense various physiological parameters such as glucose concentration. 更具体地，本发明的实施例涉及冗余传感器和传感器系统以及制造和使用这样的传感器和传感器系统的方法。 More particularly, embodiments of the present invention relates to a redundant sensors and sensor systems and methods of making and using such sensors and sensor systems. 仍更具体地，本发明的实施例涉及正交冗余葡萄糖传感器和传感器系统、制造和使用这样的传感器和传感器系统的方法、采用正交冗余葡萄糖传感器和传感器系统的闭环胰岛素输注系统以及制造和使用这样的闭环系统的方法。 Still more particularly, embodiments of the present invention relates to an orthogonal redundancy glucose sensors and sensor systems, methods of making and using such sensors and sensor systems, orthogonal redundancy glucose sensors and sensor systems and closed loop insulin delivery system methods of making and using such a closed loop system. 正常健康人的胰腺响应于升高的血浆葡萄糖水平产生并释放胰岛素到血流中。  normal healthy human pancreas in response to elevated plasma glucose levels produce and release insulin into the blood stream. 存在于胰腺中的贝塔细胞（β-细胞）产生胰岛素并将胰岛素分泌到血流中，因为它被需要。 Present in the beta cells of the pancreas ([beta] cells) produce insulin and secrete insulin into the blood stream, because it is needed. 如果β -细胞变得丧失能力或死亡（I型糖尿病），或在一些情况下如果β -细胞产生数量不足的胰岛素（II型糖尿病），则必须从另一源将胰岛素提供到身体。 If β - cells become incapacitated or dead (Type I diabetes), or in some cases if β - cells produce insufficient amount of insulin (type II diabetes), it must be from another source will provide insulin to the body. 传统上，因为胰岛素不能被口服地摄取，使用注射器注入胰岛素。  Conventionally, as insulin can not be taken orally, insulin is injected using a syringe. 更近一些，输液栗疗法的使用不断增加，特别是用于为糖尿病患者输送胰岛素。 More recently, Li infusion therapy continues to increase, particularly for the delivery of insulin for diabetics. 例如，外部输液栗被戴在皮带上、在口袋中等，并经由具有经皮针头的输液管或放置在皮下组织中的插管将胰岛素输送到身体中。 For example, the external infusion Li is worn on a belt, in a pocket medium, and the insulin delivery into the body via a cannula having an infusion tube or needle percutaneously placed in the subcutaneous tissue. 医师认识到，连续的输注提供对糖尿病患者的状况的较大控制，并越来越多地将它开给患者。 Physicians recognize that continuous infusion provides greater control over the condition of patients with diabetes, and more and more will open it to the patient. 输液栗设备和系统在医学领域中是相对熟知的，用在将所开的药物（例如胰岛素）输送或施与患者。  Li infusion devices and systems in the medical field are relatively well known, with the opening in the medicament (e.g. insulin) or administered to a patient delivery. 在一种形式中，这样的设备包括相对紧凑的栗壳体，栗壳体适合于容纳承载用于通过输液管和相关的导管或输液器具给患者服用的所开药物的注射器或储液器。 In one form, such devices comprise a relatively compact housing chestnut, chestnut for the carrier housing adapted to receive through the infusion tube and associated catheter or infusion set to a patient a pharmaceutical syringe or a reservoir opened. 可编程控制装置可连续地或以周期性间隔操作输液栗以得到在一段延长的时间内药物的紧密控制和准确的输送。 Programmable control means may continuously or at periodic intervals to obtain a Li infusion operate tightly controlled and accurate delivery of medication over an extended period of time. 这样的输液栗用于施予胰岛素和其它药物，示例性栗结构在通过引用被并入本文的美国专利号4562751、4678408、4685903、5080653和5097122中被显示和描述。 Such infusion Li for administering insulin and other drugs, Li exemplary structure is shown and described herein are incorporated by reference U.S. Patent No. 5,097,122 and in 4562751,4678408,4685903,5080653. 对每个身体来说存在基准胰岛素需要，其在糖尿病个体中可通常通过在不间断或连续的基础上使用输液栗施予患者基础量的胰岛素来维持。  The presence of the reference insulin is required for each body, which typically by diabetic individuals can be administered using an infusion Li basic amount of insulin in the patient uninterrupted or continuous basis to maintain. 然而，当额外的葡萄糖（即，超过基础水平）出现在糖尿病个体的身体中时，例如当个体消耗膳食时，待施予的胰岛素的数量和定时必须被确定，以便足够地考虑额外的葡萄糖，而同时避免过多胰岛素的输注。 However, when additional glucose (i.e., over basal levels) present in the body of a diabetic individual, for example when an individual meal consumed, quantity of insulin to be administered and timing must be determined in order to sufficiently consider additional glucose, while avoiding excessive insulin infusion. 一般，丸剂量的胰岛素被施予以补偿膳食（即，膳食丸剂）。 In general, the dose of insulin pellet diet is compensated (i.e., meal bolus) administration. 糖尿病患者通常基于膳食的碳水化合物含量来确定他们可能需要用于覆盖预期膳食的胰岛素的量。 Diabetic patients are generally based on the carbohydrate content of the meal to determine the amount of coverage they may need insulin for meals expected. 这些年来，开发了在获得糖尿病患者中的血糖水平的指示时使用的各种电化学葡萄糖传感器。  Over the years, we developed a variety of electrochemical glucose sensor use in obtaining an indication of diabetic patients blood glucose levels. 这样的读数在监测和/或调节一般包括有规律地施予患者胰岛素的治疗方案时是有用的。 Such readings in monitoring and / or adjustment typically includes regular administration of insulin treatment regimen is useful. 通常，小的和柔性的电化学传感器可用于在一段延长的时间内获得周期性读数。 Typically, a small and flexible electrochemical sensors may be used to obtain periodic readings over an extended period of time. 在一个形式中，根据薄膜掩蔽技术来构造柔性皮下传感器。 In one form, according to the configuration of the flexible thin film masking techniques to a subcutaneous sensor. 在通过引用并入本文的共同转让的美国专利号5390671、5391250、5482473和5586553中描述了典型的薄膜传感器。 Incorporated by reference herein in commonly assigned U.S. Patent Nos. 5390671,5391250,5482473 and 5586553 described a typical thin film sensor. 也参见美国专利号5299571。 See also United States Patent No. 5,299,571. 这些电化学传感器已被应用在遥测特性监测系统中。  The electrochemical sensor has been used in telemetry monitoring system characteristics. 如所描述的，例如在共同转让的美国专利号6809653(其全部内容通过引用被并入本文）中，遥测系统包括远程定位的数据接收设备、用于产生指示用户的特性的信号的传感器和用于处理从传感器接收的信号并用于将所处理的信号无线地发送到远程定位的数据接收设备的发射机设备。 As described, for example, a sensor signal commonly assigned U.S. Patent No. 6,809,653 (the entire contents of which are incorporated herein by reference), the telemetry system includes a remotely located data receiving device, for generating a characteristic indicative of the user and with to process signals received from the sensor and for transmitting the processed signals to a wireless transmitter device to the data receiving apparatus is remotely located. 数据接收设备可以是特性监测器、向另一设备提供数据的数据接收机、RF编程器、药物输送设备（例如输液栗）等。 Data receiving apparatus may be a characteristic monitor, a data providing apparatus to the other data receivers, the RF programmer, a drug delivery device (e.g. an infusion Li) and the like. 不管数据接收设备（例如葡萄糖监测器）、发射机设备和传感器（例如葡萄糖传感器）是无线地还是经由电线连接进行通信，上面描述的类型的特性监测系统都仅在它被基于个体用户的独特特性校准之后具有实际用途。  regardless of the data receiving device (e.g., glucose monitor), a sensor and transmitter device (e.g., glucose sensors) or wirelessly communicate the type described above are only characteristic of the monitoring system which is based on the individual user via the wire connection after the calibration of the unique characteristics of practical use. 因此，用户需要在外部校准传感器。 Thus, users need external calibration sensor. 更具体地，糖尿病患者需要在特性监测器系统被使用的持续时间内每天平均两到四次利用手指针刺血糖仪读数。 More specifically, diabetes require two to four times the average daily use of fingerstick blood glucose readings within a duration characteristic monitor system which is used. 每次，都将血液从用户的手指抽取并通过血糖仪分析以提供用户的实时血糖水平。 Each time, blood will be drawn from the user's finger and by analyzing blood glucose meter to provide users real-time blood glucose levels. 用户接着将该数据输入到葡萄糖监测器中作为用于校准葡萄糖监测系统的用户的当前血糖水平。 The user then inputs the data to the glucose monitor user as a glucose monitoring system for calibrating a current blood glucose level. 然而由于各种原因，这样的外部校准是不利的。  However, due to various reasons, such is unfavorable external calibration. 例如，血糖仪包括内在误差容限， 且只提供每次使用在一个时间点处的离散读数。 For example, the blood glucose meter comprises inner margin of error, and provides each time only at a discrete time point reading. 而且，即使是完全准确的，血糖仪使用起来是笨重的（例如，一个人不应操作汽车并同时获取手指针刺仪表读数），并且也容易受到不正确的使用。 And even entirely accurate blood glucose meter use is bulky (for example, a person should not be operated while the car and get fingerstick meter reading), and is also vulnerable to improper use. 此外，存在与手指针刺的每次应用相关的成本，更不用说痛苦和不舒服。 In addition, there is associated with each application fingerstick the cost, not to mention the pain and discomfort. 因此， 手指针刺的取代依然是下一代葡萄糖监测系统的目标。 Therefore, replace the finger acupuncture is still the goal of the next generation of glucose monitoring systems. 随着传感器技术改进，存在使用传感器值的较大希望以控制在闭环系统（即，人工胰腺系统）中的胰岛素的输注。  With the improved sensor technology, there is a large value desired to use the sensor in a closed loop control system (i.e., artificial pancreas system) insulin infusion. 具体地，糖尿病的闭环系统包括葡萄糖传感器和附接到患者的胰岛素输液栗，其中基于传感器的葡萄糖值读数由输液栗的控制器自动地而不是由用户/患者来管理胰岛素的输送。 Specifically, closed-loop system, including diabetes and glucose sensor attached to the patient's insulin infusion Li, wherein based on the sensor readings from the glucose infusion chestnut controller automatically and not by the user / patient to manage insulin delivery. 闭环系统的益处是多方面的，包括在当大部分低血糖事件出现时的夜间期间的较严密的血糖控制。 The benefits of closed-loop system is multifaceted, including more rigorous blood glucose control during the night when most of hypoglycemic events occur during. 为了提供提高的性能，冗余电极的可能性被探究并被显示提供了益处。  To provide improved performance, the possibility of redundant electrodes are explored and shown to provide benefits. 例如，在文献中的以前研究报告了使用两个植入式葡萄糖电极来结合信号处理算法同时监测鼠组织中的葡萄糖水平。 For example, previous studies in the literature reports the use of two electrodes implantable glucose binding signal processing algorithms while monitoring the glucose level in rat tissues. 这些研究证明，比起单个传感器的测量准确度，总葡萄糖测量准确度可被提高。 These studies demonstrate that, compared to the measurement accuracy of a single sensor, total glucose measurement accuracy can be improved. 然而，虽然它可提供提高的准确度，这样的简单冗余可能并不提供闭环应用所必需的可靠性。 However, although it provides improved accuracy, such redundancy may not provide a simple closed loop applications required reliability. 因为闭环系统作为决策制定元件代替患者，可靠的系统必须一般输送可靠的数据并具有误差检测功能，使闭环系统能够对错误的数据采取行动。  Since closed-loop system developed as a decision element instead of a patient, the system must be reliable and reliable data delivery in general and have an error detection function, closed-loop system to take action on the wrong data. 这样的数据可能由常常由于植入式环境对传感器的影响所致的传感器的漂移、噪声或临时或永久故障引起。 Such data may be, or noise caused by temporary or permanent failure often due to the drift of the sensor implanted due to environmental sensors. 行动可从简单地促使患者校准系统改变到终止传感器和请求新传感器的插入。 Simply shift action from the patient into the insertion terminates calibration system change request of the new sensor and the sensor. 使用相同的传感器配置，冗余元件类似地被环境条件影响并因此可同时呈现错误的数据。 Using the same sensor configuration, the influence of environmental conditions and thus redundant elements similarly may present erroneous data simultaneously. 因此，虽然在连续葡萄糖监测（CGM)技术中的最近发展提供了在糖尿病管理中的更容易和更有效的血糖控制的几个益处，另外的改进（例如提高的传感器准确度和可靠性、减少的数量的血糖校准、提高的特异性和在传感器插入和佩戴期间提高的舒适度）仍然是值得想望的。  Thus, while providing a continuous glucose monitoring (CGM) Recent developments in the art easier and more effective management of diabetes several benefits in glycemic control, additional modifications (e.g., improved reliability and accuracy of the sensor and reduce the number of blood glucose calibration to improve the specificity and the sensor insertion and improve comfort during wear) is still worthy of desire. 根据本发明的实施例，一种连续葡萄糖监测系统包括具有显示器的手持监测器、 外部发射机、胰岛素栗和正交冗余葡萄糖传感器。  According to an embodiment of the present invention, a continuous glucose monitoring system comprises a hand-held monitor with a display, an external transmitter, Li and quadrature insulin glucose sensor redundancy. 正交冗余葡萄糖传感器包括光学葡萄糖传感器和非光学葡萄糖传感器，非光学葡萄糖传感可以是电化学葡萄糖传感器。 Orthogonal redundancy glucose sensor comprising a glucose sensor optical and non-optical glucose sensor, glucose non-optical sensor may be an electrochemical glucose sensor. 而且，电化学传感器可具有分布式电极设计。 Further, an electrochemical sensor may have electrodes distributed design. 光学和非光学传感器中的每个具有配置成放置在用户的身体内部的远侧部分和保持在用户的身体外部的近侧部分。 Each having configured to be placed inside the body of the user and the distal portion of the optical and non-optical sensor is held in the proximal portion outside the body of the user. 光学和非光学传感器的远侧部分经由插入针头被同时部署，并可被协同定位在用户的身体内。 The distal portion of the optical and non-optical sensors are deployed through the insertion needle and may be co-located within the user's body. 在本发明的实施例中，光学葡萄糖传感器包括光纤，光纤具有连接到其远端的可渗透葡萄糖的膜。  In an embodiment of the present invention, an optical glucose sensor includes an optical fiber having a glucose permeable membrane connected to the distal end thereof. 膜可以是例如管形的，使得它的中空内部界定用于容纳试样的隔室。 For example, the film may be tubular, so that it defines a hollow interior compartment for receiving a sample. 在本发明的一个方面中，试样是包括葡萄糖受体、葡萄糖类似物、被标记到葡萄糖受体上的第一荧光团和被标记到葡萄糖类似物上的受体染料的竞争性葡萄糖结合亲合力试样。 In one aspect of the present invention, the sample is a glucose receptor, a glucose analogue, labeled to a first fluorophore on labeled glucose receptor and acceptor dye to glucose analog on glucose competitively binding affinity force sample. 在本发明的这个方面的变型中，除了第一荧光团以外，试样还包括尤其用作传感器诊断工具的参考荧光团。 In a variation of this aspect of the present invention, in addition to a first fluorophore, further comprising a particular sample as a diagnostic tool sensor reference fluorophore. 在本发明的实施例中，外部发射机具有容纳光学葡萄糖传感器的近侧部分和非光学葡萄糖的近侧部分的壳体。  In an embodiment of the present invention, an external transmitter housing having a proximal portion and a proximal portion of the non-optical glucose receiving optical glucose sensor. 传感器的相应近侧部分操作性地耦合到用于接收并处理来自光学和非光学传感器的相应信号（包括将光学和非光学信号中的每个转换成相应的葡萄糖值）的仪器。 Respective proximal portion operatively coupled to the sensor device for receiving and processing a respective signal from the optical and non-optical sensors (including optical and non-optical signals each of glucose converted to the corresponding value). 发射机还包括用于将相应的葡萄糖值无线地传递到手持监测器、胰岛素栗等的额外的仪器。 The transmitter further comprises means for the respective glucose value wirelessly transmitted to the hand-held monitor, additional instrumentation chestnut like insulin. 在本发明的实施例中，作为仪器的部分，发射机容纳用于被包含在光学传感器中的试样的寿命和/或强度询问的光学系统。  In an embodiment of the present invention, as part of the instrument, a transmitter for receiving optical system is contained in the lifetime of an optical sensor sample and / or the intensity of the interrogation. 例如，可以通过光学询问系统询问荧光团标记的试样，光学询问系统包括光源和具有一个或多个涂层以实现例如激发过滤器和/或发射过滤器的滤波器衬底。 For example, you can ask fluorophore-labeled sample by an optical interrogation system, the optical interrogation system comprises a light source and having one or more coatings, for example, to implement filters excitation filter substrate and / or the transmitter filter. 在本发明的一个方面中，询问系统可被制造为晶片规模堆叠的平面集成光学系统（SPIOS)并被切成较小的单元。 In one aspect of the invention, the interrogation system may be manufactured as a stack of wafer-scale planar integrated optical system (SPIOS) and cut into smaller units. 在另一方面中，光源可以是LED或红色激光二极管，后者实现在发射机的尺寸和体积上的明显减小。 In another aspect, the light source may be a red LED or a laser diode, which is achieved is significantly reduced in size and volume of the transmitters. 上述特征和方面也可在具有预测性诊断和对外部校准的最低要求的闭环系统中实施。  The above features and aspects may also be implemented in a closed loop system with predictive diagnostics and minimum requirements for the external calibration. 从结合附图作出的下面的详细描述中，本发明的其它特征和优点将变得明显，附图仅作为例子示出本发明的实施例的各种特征。  from the following detailed description taken in conjunction with the accompanying drawings Other features and advantages of the present invention will become apparent, various features of the drawings only as an example shows an embodiment of the present invention. 图IA和IB根据本发明的实施例示出用于正交冗余感测的连续葡萄糖监测系统。  FIGS. IA and IB according to an embodiment of the present invention illustrating a continuous glucose monitoring system for sensing orthogonal redundancy. 图2示出针对目标的电化学传感器改进的基于系统的方法。  FIG. 2 shows an improved electrochemical sensor for the target system based approach. 图3A-3C根据本发明的实施例示出在皮肤之下植入的基于胶囊的光学传感器。  Figures 3A-3C illustrate an optical-based sensor implanted beneath the skin of the capsule according to an embodiment of the present invention. 图4根据本发明的实施例示出包括内部参考物的葡萄糖结合竞争性亲合力荧光团标记的试样。  FIG 4 according to embodiments of the present invention illustrating the internal reference material comprises a glucose competitive binding affinity of fluorophore-labeled samples. 图5根据本发明的实施例示出用于询问具有用于强度测量的内部参考物的荧光团标记的试样的光学询问系统。  FIG 5 according to an embodiment of the present invention is shown an optical interrogation system for interrogating an internal reference material having an intensity measurement of fluorophore-labeled samples. 图6A根据本发明的实施例示出光学葡萄糖传感器的各种平衡和非葡萄糖消耗特征。  FIG 6A shows various balanced optical glucose sensor and glucose consumption non-feature of the embodiment of the present invention. 图6B根据本发明的实施例示出作为光学传感器的诊断工具的参考荧光团的使用，参考荧光团指示例如膜的整体性何时可能被损害或光学连接何时可能已未对准。  FIG 6B illustrates an embodiment according to the present invention is used as a diagnostic tool optical sensor reference fluorophores, the fluorophore reference indicate, for example when the membrane integrity could be compromised when the optical connection or may have been misaligned. 图7根据本发明的实施例示出沿着电化学传感器的长度分布的多个传感器电极。  FIG. 7 illustrates a plurality of sensor electrodes distributed along the length of the electrochemical sensor according to an embodiment of the present invention. 图8A根据本发明的实施例示出包含在耦合到光纤的远端的膜内的试样的光纤传感器的侧视图，激发光进入光纤且荧光离开光纤。  FIG. 8A according to an embodiment of the present invention shown coupled to the sample contained in the side view of the distal end of the optical film of the optical fiber sensor, and the fluorescence excitation light enters the optical fiber exits the fiber. 图8B根据本发明的实施例示出图8A的光纤葡萄糖传感器，示出试样的细节。  The embodiment according to FIG. 8B illustrates an embodiment of the present invention an optical fiber glucose sensor of FIG. 8A, showing details of the sample. 图9A是根据本发明的实施例的用于连接到电化学传感器和光学传感器的双重连接器的发射机的剖面图。  FIG. 9A is a sectional view of the connector connected to the dual electrochemical sensor and an optical sensor in a transmitter according to an embodiment of the present invention. 图9B是根据本发明的实施例的发射机的剖面图，其具有电化学传感器和光学传感器的光学连接、电接触和协同定位部署。  FIG 9B is a sectional view of the embodiment of the transmitter of the present invention, an electrochemical sensor having an optical connector and an optical sensor, electrical contacts and co-located deployment. 图9C根据本发明的实施例示出集成柔性电路的剖面图。  Figure 9C illustrates a cross-sectional view of a flexible integrated circuit according to an embodiment of the present invention. 图10是根据本发明的实施例用于容纳和同时部署电化学传感器和光学传感器的针的侧视图。  FIG. 10 is a side view of a deployed and a needle receiving an electrochemical sensor and an optical sensor according to an embodiment of the present invention. 图11根据本发明的实施例示出基于从具有集成仪表的手持监测器得到的仪表值的误差校验特征的图解例证。  FIG. 11 shows a characteristic based on the error check value obtained from the instrument monitor having an integrated hand-held meter in accordance with the exemplary embodiment illustrated embodiment of the present invention. 图12示出与本发明的实施例有关的光学平衡葡萄糖传感器和电化学葡萄糖传感器的理论响应功能。  FIG. 12 shows the theoretical optical balance and electrochemical glucose sensor of Example glucose sensor of the present invention related to the response function. 图13A和13B根据本发明的实施例示出用于分析信号并执行诊断以评估单独信号的可靠性并通过校准来分配权重的算法。  FIGS. 13A and 13B show analysis of the reliability signal and performs a diagnostic to evaluate the individual signals according to embodiments of the present invention and to assign weights by calibration algorithm. 图14根据本发明的实施例示出在用于将传感器信号转换成血糖值的算法中利用的两个隔室模型。  FIG. 14 shows a two-compartment model utilized in the algorithm for converting the signal into a blood glucose level sensor according to an embodiment of the present invention. 图15是根据本发明的实施例的通过以其可靠性指数（a)评估每个单独传感器电流并创建加权平均（b)来提高传感器准确度的图示。  FIG. 15 is (a) evaluate each individual current sensor according to the reliability index thereof by an embodiment of the present invention to create a weighted average and (b) illustrates the sensor to improve the accuracy. 图16示出在现有系统（a)和本发明的实施例（b)之间的校准频率与时间的比较。  FIG. 16 shows a comparison alignment between frequency and time in the conventional system (a) and Example (b) of the present invention. 图17A和17B根据本发明的实施例示出在检测低频尼奎斯特斜率（a)的下降时的电化学阻抗显微镜的使用，该低频尼奎斯特斜率预测传感器信号中的漂移（b)。  FIGS. 17A and 17B using electrochemical impedance microscope according to an embodiment of the present invention are illustrated in the falling detecting low Nyquist slope (a) of the Nyquist slope of the low frequency drift prediction sensor signal ( b). 图17C根据本发明的实施例示出用于提高的可靠性的主动识别传感器异常的预测性诊断。 Reliability active recognition sensor  FIG. 17C according to embodiments of the present invention is shown for improving the abnormality predictive diagnostics. 图18根据本发明的实施例示出具有分立部件（左）和堆叠平面集成光学系统(右）的光学系统。  FIG. 18 illustrates an optical system with discrete components (left) and stacking planar integrated optical systems (right) according to an embodiment of the present invention. 图19根据本发明的实施例示出晶片规模的堆叠平面集成光学系统（SPIOS)的例证性层。  FIG. 19 illustrates a stack of wafer-scale integrated planar optical systems (SPIOS) layer according to an illustrative embodiment of the present invention. 图20根据本发明的实施例示出关键光学传感器电子部件到用于电化学感测的模拟前端的添加。  FIG. 20 illustrates a key component of the optical sensor electronics to add an analog front end for electrochemical sensing according to an embodiment of the present invention. 图21根据本发明的实施例示出可与645nm激光二极管源一起使用的三个荧光团的波长范围。  21 three wavelength range of the fluorophore view of an embodiment of the present invention is shown that may be used with a 645nm laser diode source. 图22根据本发明的实施例示出使用各种部件和方法的护理网络。  Figure 22 illustrates various components and networks using the method of treatment according to an embodiment of the present invention. 在下面的描述中，参考形成其一部分并示出本发明的几个实施例的附图。  In the following description, with reference to form a part hereof and the accompanying drawings illustrate several embodiments of the present invention. 应理解， 可利用其它实施例且可进行机构上和操作上的改变而不偏离本发明的范围。 It should be understood that other embodiments may be utilized and means and changes may be made operational without departing from the scope of the invention. 如在附图中为了说明的目的所示的，本发明的实施例涉及可经皮肤被引入和/或射入或可植入皮下、真皮、真皮下、腹腔内或腹腔组织中和/或通过皮下、真皮、真皮下、腹腔内或腹腔组织植入的传感器。  As for purposes of illustration, embodiments of the present invention relates may be introduced through the skin as shown in the drawings and / or subcutaneous injections or implantable, dermal, intradermal, intraperitoneal or abdominal tissue and / or by subcutaneous, intradermal, subdermal, intraperitoneal or abdominal tissue implanted sensor. 在本文的讨论中，参考作为分析物的葡萄糖描述了本发明的设备、系统和方法的优选实施例，该分析物在用户的血液和/或体液中的水平/浓度待确定。 In the discussion herein, as the glucose analyte reference describes an apparatus of the invention, embodiments of systems and methods preferably, the analyte levels in the blood and body fluids / or user / concentration to be determined. 然而，这作为例证而不是限制，因为本发明的原理、设备、系统和方法可用于感测和/或确定各种其它生理参数、制剂、特性和/或成分的水平。 However, this is by way of illustration and not limitation, because of the principle, devices, systems and methods of the invention may be used for other physiological parameters, formulations, and the level of various characteristics / or sensing components and / or determined. 鉴于在连续葡萄糖监测中的上面提到的需要，本发明的实施例目的在于以正交冗余传感器系统的形式的更鲁棒的解决方案。  In view of the above-mentioned needs in the continuous glucose monitoring, object of embodiments of the present invention is in the form of an orthogonal redundant sensor system more robust solution. 正交冗余被定义为使用两种不同的技术来达到同一目标的两个设备，其中这两个设备的故障模式完全是独特的且不交叉。 It is defined as the orthogonal redundancy using two different techniques to achieve the same goal two devices, wherein the failure mode of the two devices is completely unique and not cross. 这可通过被组合到单个身体佩戴设备中的独特葡萄糖检测方案的使用来应用于连续葡萄糖感测。 This can be combined into a single wearable device using a unique detection scheme to apply to the glucose continuous glucose sensing. 用于每个传感器的不同的测量技术、响应和故障模式提供真实的冗余以确保可靠和安全的葡萄糖测量，而不管环境响应或传感器异常如何。 Different measurement techniques for each sensor, response and failure modes to provide true redundancy to ensure reliable and safe glucose measurements, regardless of the environment or sensor anomaly how to respond. 在本发明的实施例中，上面提到的正交冗余可通过组合光学感测和电化学感测的技术来建立以提供对抗植入环境的复杂性的独特解决方案。  In an embodiment of the present invention, the above-mentioned orthogonal redundancy can be established to provide a unique solution to the complexity of the implant against the environment by a combination of optical sensing techniques and electrochemical sensing. 两个（即，光学和电化学）传感器受到不同类型的干扰、故障模式和身体响应，如在下面的表2中描述的。 Two (i.e., electrochemical, and optical) sensors are subject to different types of interference, failure modes and in response to the body, as described in Table 2 below. 出于这种考虑， 可计算并加权每个传感器的可靠性以提供更鲁棒和准确的葡萄糖传感器测量。 With this in mind, the reliability calculated and the weighting of each sensor to provide a more robust and accurate measurement of glucose sensor. 因此，如表2 所示，由每个传感器对干扰物和环境扰动的独特和不同的响应提供了增强的能力来诊断和过滤环境响应。 Accordingly, as shown in Table 2, in response to a unique and different for each sensor interferer and environmental perturbations provides the ability to diagnose and enhanced environmental response filter. 参考上面的表2,进一步发现，光学传感器的干扰分布非常不同于电化学传感器的干扰分布。  Referring to the above Table 2, it was further found that the interference of the optical sensors is very different from the distribution of the interference distribution electrochemical sensor. 因此，对于所有三个主要电化学干扰物质，即，醋氨酚、尿酸和抗坏血酸，单荧光团光学传感器没有干扰或具有在与电化学传感器的方向相反的方向上的干扰信号。 Thus, for all three major electrochemically interfering substance, i.e., acetaminophen, uric acid and ascorbic acid, a single fluorophore or an optical sensor does not interfere with an interference signal in a direction opposite to the direction of the electrochemical sensor. 在葡萄糖传感器中存在几个不准确性源。  There are several inaccuracies in source glucose sensor. 这些不准确性可引起可通过校准来校正的传感器读数中的误差，或它们可能是传感器不能恢复的更严重的误差。 These inaccuracies may cause an error can be corrected by calibrating the sensor readings, or they may be more serious error sensor can not be restored. 最常见的误差源和对单独传感器的影响在下面的表3中列出。 The most common error sources and impact on the individual sensors in the following Table 3. 表3 :光学和电化学传感器的传感器不准确性源以及简单和正交冗余对传感器性能的益处。  Table 3: optical source sensor inaccuracies and electrochemical sensor, and a simple and quadrature redundant sensor performance benefits. "NB" =无益处，"PB" =潜在的益处，以及"CB" =明确的益处。 "NB" = no benefit, potential benefits = "PB", and "CB" = clear benefits. *在传感器周围的降低的葡萄糖的故障模式假定是由于到传感器植入位置的衰减的灌注。  * at reduced around the sensor failure mode is assumed to be due to glucose sensor implanted infusion attenuation position. **在某些医院程序例如腹腔透析中使用的麦芽糖的干扰电位接受评估以确定这影响在间质流体中可得到的浓度中的光学传感器响应的程度。  ** In some hospitals interference peritoneal dialysis using programs such as maltose evaluated to determine the potential influence degree that the optical sensor is obtained at a concentration in the interstitial fluid response. 已知从多个电化学传感器获取的信号可以简单冗余的形式提供提高的性能，该简单冗余通过同一探针上的多个电极或通过利用空间分离和两个单独的探针来实现。  The known signals acquired from a plurality of electrochemical sensors may be provided in the form of a simple redundancy to improve performance, the plurality of electrodes by simple redundancy on the same probe or separate probes through two separate and use of space to fulfill. 例如， Medtronic公司出售包括两个探针的医院葡萄糖传感器，在每个探针上有两个工作电极，导致四个独立的葡萄糖信号。 For example, sold by the company Medtronic hospital glucose sensor comprises two probes, there are two working electrodes on each probe, resulting in four independent glucose signaling. 也由Medtronic公司开发了利用多个电化学传感器的系统。  have developed a system using a plurality of electrochemical sensors by Medtronic, Inc.. 然而，这些系统仍然不通过具有单独和不同的故障模式的替代感测技术提供真实冗余。 However, these systems still have individually different sensing techniques and alternative modes of failure through not provide true redundancy. 作为例子，研究表明，当电化学传感器从皮下区被拉到真皮层中时，传感器信号变为零。 By way of example, studies show that when the electrochemical sensor from the skin dermal layer region is pulled, the sensor signal becomes zero. 比较起来，光学传感器在真皮和皮下区中很好地运转，这允许光学传感器即使在传感器部分地被移植时也维持功能， 给患者提供测量，直到患者能够更换传感器为止。 By comparison, the optical sensors operate well in the dermis and the subcutaneous region, which allows the optical sensor function is maintained even when the sensor portion to be transplanted, providing a measurement to the patient until the patient until the sensor can be replaced. 利用电化学传感器的简单冗余将导致在部分移植的情况下来自两个传感器的不准确的数据。 Redundancy using a simple electrochemical sensor will result in inaccurate data from the two sensors in the case of partial grafting. 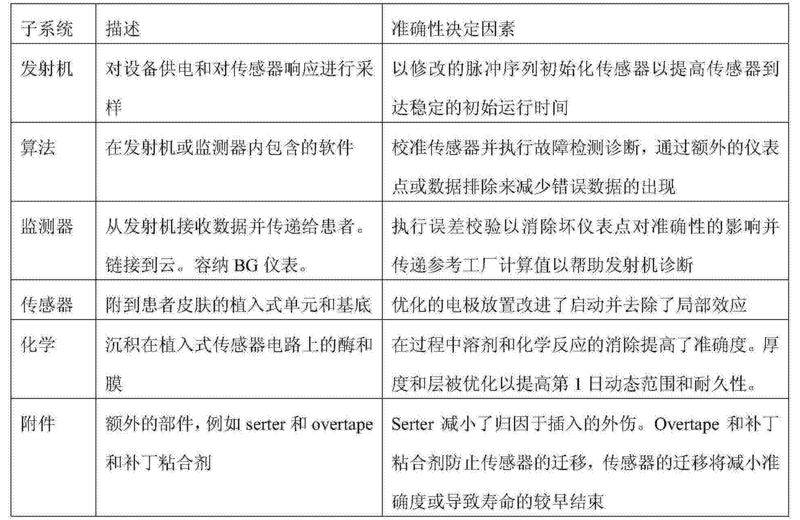 见上面的表3。 See Table 3 above. 简而言之，为了实现连续葡萄糖监测系统（包括闭环）的所需可靠性，正交冗余是必要的。  Briefly, in order to achieve a continuous glucose monitoring system (including closed loop) of the desired reliability, redundancy is necessary orthogonal. 使用正交冗余感测，维持简单冗余的优点，有具有在光学和电化学传感器之间的不同的敏感性和干扰的额外益处。 Using orthogonal redundancy sense, the advantage of maintaining a simple redundancy, additional benefit of having a different sensitivity and interference between optical and electrochemical sensors. 因此，在本发明的实施例中，正交冗余传感器可包括光学传感器和电化学传感器，其中后者可包括多达例如5个独立的感测电极。 Thus, in the embodiment of the present invention, the orthogonal redundant sensors may include an optical sensor and an electrochemical sensor, for example, the latter of which may include up to five separate sensing electrodes. 图IA和IB根据本发明的实施例示出用于正交冗余感测的连续葡萄糖监测系统的部件。  FIGS. IA and IB illustrates a means for continuous glucose monitoring system for sensing orthogonal redundancy according to an embodiment of the present invention. 参考下面的表4,在开发传感器系统时，考虑整个系统在准确性上的角色，且使用基于系统的设计方法。 Referring to Table 4 below, in the development of a sensor system, consider the role of the entire system in accuracy, and a method using the design system. 因此，如在表4中详述的，每个子系统或部件在对准确性做出贡献时扮演基本角色。 Therefore, as detailed in Table 4, each of the subsystems or components play a fundamental role in the accuracy contribute. 如将在下面更详细描述的，本发明的实施例的一个目标是继续同时提高性能和可用性。  As will be described in more detail below, an object of embodiments of the present invention is to continue to simultaneously improve performance and availability. 因此，在上面的表4中所述的每个子系统中，电化学传感器性能进步聚焦于通过目标改进来减少变化。 Thus, in each subsystem according to Table 4 above, the progress of the electrochemical sensor performance by focusing on certain improved to reduce variations. 这些目标改进设计成提高第1日性能、耐久性和血糖过少和血糖过多性能，并在图2中被详述。 These improvements are designed to increase the target first day performance, durability and too little blood glucose and hyperglycemic properties, and is detailed in FIG. 目标改进将电化学传感器驱动到遍及传感器、葡萄糖范围并随着时间的可预测的灵敏度。 The improved electrochemical sensor target to drive throughout the sensor, with the predictable range of glucose and time sensitivity. 作为异常值保留的传感器异常可通过预测性传感器诊断来减少，该预测性传感器诊断主动检测错误或故障，并在它导致不准确的葡萄糖测量之前重新校准或关闭传感器。 Sensor abnormality as an abnormal value retention can be reduced by a predictive sensor diagnostic, predictive of the active sensor diagnostic error or fault is detected, and it results in closing sensor before recalibration or inaccurate glucose measurement. 应理解，对于给定的传感器或感测系统，平均绝对相对差异/偏差（MARD)值越低， 传感器或感测系统的准确性就越高。  It should be understood, for a given sensor or sensing system, mean absolute relative difference / deviation (The MARD) lower the value, the higher the accuracy of the sensor or the sensing system. 如图2所示，本发明的基于系统的方法（针对目标传感器改进）将电化学传感器的MARD值从大约16%减小到大约9%和优选地更小。 2, a method based on the system (for improved target sensor) MARD value of the electrochemical sensor of the present invention is reduced from about 16% to about 9%, and preferably less. 例如，关于发射机10,通过提高响应性并减小滞后时间（附图标记11)将MARD减小了0. 5%。 For example, with respect to the transmitter 10, by increasing the responsiveness and reduce the lag time (reference numeral 11) is reduced to 0.5% MARD. 类似地，关于电化学传感器200的设计，通过影响分布式电极设计以便减小局部效应（参考数字201)将MARD减小了额外的0. 5%。 Similarly, for the design of the electrochemical sensor 200, the electrode design to reduce the influence of distributed local effect (reference numeral 201) will be reduced MARD an additional 0.5%. 牢记上述内容，本发明的实施例涉及包括基于光学的传感器和非光学传感器的正交冗余葡萄糖传感器。  bearing in mind the foregoing, embodiments of the present invention relates to a glucose sensor includes an orthogonal redundancy-based non-optical sensors and optical sensors. 因此，在本发明的上下文内，在正交冗余葡萄糖传感器中，可使用基于光学的葡萄糖传感器来实现上述电化学（即，非光学）葡萄糖传感器。 Thus, within the context of this invention, orthogonal redundancy glucose sensor, this can be done electrochemically (i.e., non-optical) optical glucose sensors based glucose sensors. 在图3A-3C中所示的本发明的实施例中，光学传感器可以是插在真皮层中的皮肤81之下的传感器胶囊80， 阅读器设备82位于皮肤之上。 In an embodiment of the present invention shown in Figures 3A-3C, the optical sensor may be inserted in the dermis of the skin beneath the sensor 81 of the capsule 80, the reader device 82 located above the skin. 光穿过真皮层在阅读器设备82和传感器80之间透射，以便激发皮肤之下的感测元件，且在阅读器设备中测量因而产生的荧光。 Light passes through the dermis layer between the reader device 82 and the transmissive sensor 80, in order to stimulate the skin beneath the sensing element, and the fluorescence reading device thus produced was measured. 图3C示出示例性光学传感器胶囊80的相对尺寸。 FIG. 3C shows an exemplary optical sensor 80 relative dimensions of the capsule. 在图4和5所示的替代实施例中，可通过使用经皮光纤来实现光学传感器。  In an alternative embodiment shown in FIG. 4 and 5, the optical sensor may be implemented by using a transdermal fiber. 在这里，光纤用作光导，感测元件附接到光纤的远侧顶端。 Here, the optical fiber as a light guide, the sensing element is attached to the distal tip of the optical fiber. 光纤穿过皮肤延伸，其中它与阅读器设备对齐。 Fiber extending through the skin, where it is aligned with the reader device. 光通过光纤在阅读器设备和感测元件之间透射。 Light transmission between the optical fiber and the reader device through the sensing element. 在优选实施例中，感测元件包括由可渗透葡萄糖的膜围绕的葡萄糖结合竞争性亲合力试样，允许试样内的葡萄糖与存在于周围组织中的葡萄糖平衡。  In a preferred embodiment, the sensing element comprises a glucose-permeable membrane surrounding the glucose a competitive affinity binding sample, allowing glucose in the sample present in the surrounding tissue glucose homeostasis. 试样又包括葡萄糖类似物（例如葡聚糖）和葡萄糖受体（例如甘露聚糖结合凝集素（"MBL"）），其被荧光团标记以传递荧光。 And the sample include glucose analogs (e.g., dextran) and a glucose receptor (e.g. mannan-binding lectin ( "MBL")), which is labeled fluorophore fluorescence to pass. 在分别结合到葡萄糖和葡聚糖之间的MBL的平衡决定了响应于试样的照明的荧光强度。 MBL respectively coupled to the balance between glucose and dextran determine the fluorescence intensity in response to illumination of the sample. 用另一荧光团标记的非葡萄糖感测大分子用作内部参考（即，参考荧光团）， 其中参考荧光团响应于照明而发射其自己的荧光。 Fluorophore-labeled with the other non-glucose-sensing is used as internal reference molecules (i.e., the reference fluorophore), wherein the reference fluorophore in response to illumination of its own fluorescence emission. 将试样荧光强度和参考荧光强度的比转换成葡萄糖浓度。 The sample conversion ratio of fluorescence intensity and fluorescence intensity to a reference glucose concentration. 可例如通过包括在光纤的远端处的包含试样的可渗透葡萄糖的膜来形成具有试样隔室的光学葡萄糖传感器。  may be formed, for example, an optical glucose sensor having a sample compartment by including a glucose-permeable film containing a sample at the distal end of the optical fiber at. 光纤可接着被经皮地插入用户的身体内，从而使试样隔室位于用户的组织中，同时将光纤的至少一部分留在身体外部，使得它可被询问系统访问（即， 光学地耦合到询问系统或与询问系统对齐）。 Optical fibers may then be percutaneously inserted into the body of the user, so the user located in the sample compartment of tissue, while at least a portion of the optical fiber remaining outside the body, so that it can be accessed interrogation system (i.e., optically coupled to interrogation and interrogation system or alignment system). 替代地，光学传感器可以是可植入的，例如作为包括询问光电系统和电源的可植入葡萄糖监测器的部分。 Alternatively, the optical sensor may be implanted, for example, as part of a photovoltaic system including interrogation and power the implantable glucose monitor. 试样隔室可在可渗透葡萄糖的膜和到光电系统的光学接口之间形成。 The sample compartment may be formed between the film and the glucose permeable interface to a photoelectric optical system. 可渗透葡萄糖的膜可优选地是生物可降解的。 Glucose-permeable membrane may preferably be biodegradable. 如在上面提到和在图4中示出的，光学葡萄糖传感器可基于竞争性葡萄糖结合亲合力试样，其包括包含在试样隔室中的葡萄糖受体（例如MBL)和葡萄糖类似物/配体（例如IlOkDa葡聚糖）。  As mentioned and shown in FIG. 4 in the above, an optical glucose sensor may be based on competitive binding affinity glucose sample, comprising a sample compartment comprising the glucose receptor (e.g., MBL) and glucose analog / ligand (e.g. IlOkDa dextran). 在MBL和葡萄糖状分子（例如葡聚糖）之间的结合是可逆的。 MBL binding between glucose and the like molecules (e.g. dextran) is reversible. 当没有葡萄糖存在时，MBL和葡聚糖将主要地结合在一起。 When there is no presence of glucose, MBL and dextran will be primarily bonded together. 当葡萄糖被添加到试样时，它将竞争掉一部分葡聚糖群体，使得试样进入新的平衡状态。 When glucose is added to the sample, it will compete off a portion dextran groups, such that the sample into a new equilibrium state. 该平衡状态始终对应于葡萄糖浓度。 The equilibrium state always corresponds to the glucose concentration. 为了确定这个平衡状态，使用供体荧光团（例如Alexa Fluor594或AF594)标记MBL，并使用受体染料（例如六甲氧基晶紫-I(HMCVl)-一由Medtronic公司制造的私有结晶紫衍生物） 标记葡聚糖。 To determine this equilibrium state, the use of donor fluorophore (e.g. Alexa Fluor594 or AF594) labeled MBL, and the use of acceptor dye (e.g. hexamethoxymethylmelamine crystal violet -I (HMCVl) - a proprietary crystal violet derivative manufactured by the company Medtronic ) labeled dextran. 供体荧光团和受体染料一起形成拘r对er共振能量转移（FRET)对，即，荧光团的发射光谱和染料的吸收光谱重叠。 Forming donor fluorophore and acceptor dyes with the arrest of r er resonance energy transfer (FRET) pair, i.e., the absorption spectrum and the emission spectrum of a fluorophore overlaps dye. FRET的出现影响激发状态的寿命和所发射的荧光的强度，并可只出现在荧光团和相应的染料极接近（即，在大约50又的范围内）时。  FRET occurrence of impact strength and lifetime of the excited fluorescence emitted state, and only in the respective dye and the fluorophore in close proximity (i.e., within about 50 and the range). 因此，FRET机制允许通过照亮试样并测量激发状态的寿命（"寿命询问"）和/或从供体荧光团所发射的荧光的强度（强度询问）来光学地询问平衡状态。 Thus, FRET mechanisms allow lifetime ( "lifetime query") by illuminating the sample and measuring the excited state and / or to optically interrogate the intensity balance of the donor fluorophore fluorescence emission (intensity interrogation). 在本发明的实施例中，后一种方法是优选的，因为它比起寿命询问将试样暴露到少25倍的光。 In an embodiment of the present invention, the latter method is preferred, since it asks life compared to samples were exposed to 25 times less light. FRET机制提供几个优点。  FRET mechanism provides several advantages. 首先，它在适当的波长范围内经皮地工作，使得来自皮肤的干扰被最小化。 First, it works transdermally in the appropriate wavelength range, so that the interference from the skin is minimized. 其次，FRET荧光寿命测量通常对传感器和阅读器单元的相对位置是不敏感的，只要它们在彼此的光学可及范围内，并且对环境中的变化也是不敏感的，这帮助使系统实质上变得免校准。 Secondly, the FRET fluorescence lifetime measurements are usually the relative position of the sensor unit and the reader is not sensitive, so long as they are within range of each other and optically, and also insensitive to changes in the environment, which helps make the system becomes substantially get calibration-free. 最后，如果得到适当的供体-受体比和适当的供体-受体几何结构， FRET被认为是非常灵敏的。 Finally, if properly donor - acceptor and a suitable ratio of donor - acceptor geometry, the FRET is considered to be very sensitive. 在选择FRET对时，供体荧光团和受体染料优选地是水溶性的，因为它们在水环境中起作用。  When selecting a FRET pair, the donor fluorophore and acceptor dyes are preferably water-soluble, as they function in an aqueous environment. 此外，因为传感器被植入或存在于身体中，两个FRET部件应是无毒的，以及在37°C下在间质流体（ISF)中稳定至少两个星期。 Further, since the sensor is implanted in the body or present, two FRET components should be non-toxic, and stable for at least two weeks in the interstitial fluid (ISF) at 37 ° C. 而且，来自FRET对的荧光发射应在红/远红光谱中以最小化来自皮肤中的物质和/或组织自荧光的干扰。 Further, fluorescence emitted from the FRET pair should be red / far-red spectrum to minimize and / or interfering substances tissue autofluorescence from the skin. 对光致漂白的抵抗性，即，染料和MBL和葡聚糖的耐光性也是重要的。  The photo-bleaching resistance, i.e., dextran and MBL dyes and light resistance are important. 蛋白质的耐光性起源于其对由激发的染料产生的基团氧物种（ROS)的抵抗性，且是试样的稳定性中的重要特征。 Origin of protein lightfastness resistance to its group oxygen species (ROS) generated by the excitation of the dye, and is an important feature in the stability sample. 如将在下文中进一步讨论的，这也是为什么MBL比其它蛋白质相对更耐电子束辐射（湿或干）的原因。 As will be discussed further below, this is the reason why the MBL relatively more resistant to electron beam radiation (wet or dry) than other proteins. 最后，供体荧光团和受体染料必须对适合于蛋白质（优选地胺）接合的耦合化学过程起作用。  Finally, the donor fluorophore and acceptor dyes to be adapted to act on the protein (preferably an amine) joined coupling chemistry. 如上所讨论的，在本发明的实施例中，以供体荧光团经由在赖氨酸残余物上的ε -胺族使用荧光团的N-羟基琥珀酰亚胺（NHS)衍生物来标记MBL分子，因为这个化学过程产生在蛋白质和荧光团之间的非常稳定的酰胺键合，且在不损害蛋白质的PH值下在含水缓冲液中很好地工作。 As discussed above, in the embodiment of the present invention, for the fluorophore via a lysine residue ε of - aromatic amines using N- hydroxysuccinimide (NHS) derivative fluorophore labeled MBL molecules, because the chemical process generates very stable amide linkage between the protein and the fluorophore, and without prejudice to work well in an aqueous buffer at a PH value of the protein. 从光学观点看，很多不同的荧光团例如Alexa Fluor荧光团、TexasRed和Cy5可用作荧光团。  From an optical standpoint, a number of different fluorophores Alexa Fluor e.g. a fluorophore, may be used as TexasRed and Cy5 fluorophores. 然而，已发现，Alexa Fluor荧光团工作得最好，因为它们呈现和/或促进几个实际优点，例如耦合化学性质、水溶性、光稳定性和量子产量。 However, it has been found, Alexa Fluor fluorophores works best, because they exhibit, and / or promotion of several practical advantages, for example, chemical coupling properties, water solubility, photostability and quantum yield. Alexa Fluor594(AF594)特别地在与MBL的接合过程中工作得良好；它作为NHS衍生物是市场上可买到的，且因此准备耦合到MBL分子上的赖氨酸残余物。 Alexa Fluor594 (AF594) in particular in the joining process to MBL works well; as NHS derivative are commercially available, and is thus ready to be coupled to a lysine residue on the MBL molecules. 单MBL多肽具有19个赖氨酸残余物，其都是潜在的接合位置。  MBL polypeptide having a single lysine residue 19, which is a potential engaging position. 多肽在三层中组织，每层具有3个碳水化合物识别域（CRD)，其通常使用9、12或15个CRD再次形成较高的复合物。 Three polypeptide in tissue, each having three carbohydrate recognition domain (CRD), typically using 9, 12 or 15 higher CRD complexes formed again. 对于本发明的实施例，已发现，使用大约〇. 8-1AF594/CRD的AF594的标记的程度(DOL)给出最佳剂量响应，而利用HMCVl标记的葡聚糖作为配体。 For the embodiment of the present invention, it has been found that the degree of (DOL) labeled using approximately square. 8-1AF594 / CRD AF594 gives the optimal dose-response, while the use of labeled dextran HMCVl as a ligand. 太高的DOL值将导致自淬灭，而太低的DOL值将损害信号幅度。 DOL too high a value will lead to self-quenching, and too low a value DOL will damage the signal amplitude. 应注意，当使用NHS作为接合化学物质时，AF594将每多肽链或多或少地随机耦合到这19个赖氨酸残余物。 It is noted that, when used as the bonding chemicals NHS, AF594 each polypeptide chain is more or less random coupled to the 19 lysine residues. 这意味着远离CRD位于MBL的胶原状域中的赖氨酸残余物上的AF594可以不参与FRET，除非葡聚糖分子（尺寸110.0 OODa) 由于其线性构型而能够使用HMCVl染料到达这样的AF594的FSreier空间。 AF594 on which means is located remote from the CRD domain of MBL collagen like lysine residue may not participate in FRET, unless the dextran molecule (dimensions 110.0 OODa) because of its linear configuration, it is possible to use such a dye reached HMCVl AF594 the FSreier space. 如所提到的，传感器中的配体优选地是被提供有胺族的葡聚糖，以便能够使用用于使用受体染料进行标记的NHS耦合化学过程。  As mentioned, the ligand is preferably a sensor is provided with an amine group of dextran to be used for using NHS-labeled acceptor dye coupling chemistry. 对于后面的受体染料，六甲氧基晶紫-I (HMCVl)是优选的，优于市场上可买到的受体染料，因为它是"非荧光的"，即，它具有与AF594的发射光谱重叠的吸收光谱，而不与AF594的吸收光谱重叠太多，且对NHS起作用，即，它具有羧基族。 For the latter acceptor dye, crystal violet hexamethoxymethylmelamine -I (HMCVl) are preferred, than the commercially available dye receptor as it is emitted "non-fluorescent", i.e., it has a AF594 spectral overlap of the absorption spectrum, but not too much overlap with the absorption spectrum of AF594, and acts on the NHS, i.e., it has a carboxyl group. 上述非荧光是重要的，因为它帮助不仅减少对供体发射的光干扰的量，而且减少所需的光学仪器的量。 The non-fluorescent is important not only because it helps reduce the amount of interference of light emitted by the donor, and the amount required to reduce optical instrument. 此外，HMCVl是通用的，使得它可也与其它荧光团（例如AF647) -起使用，下面结合作为光源的红色激光二极管的使用来充分讨论AF647。 Further, HMCVl is generic, so that it can be also other fluorophores (e.g., AF647) - used together, the following combination of red laser diode as a light source to a full discussion of AF647. 对于本发明的实施例，已发现，每葡聚糖分子大约5个HMCVl分子利用荧光团标记的葡萄糖受体MBL-AF594产生最佳剂量响应。  For the embodiment of the present invention, it has been found that approximately 5 molecules per dextran molecule HMCVl using fluorophore-labeled glucose receptor MBL-AF594 produce optimal dose response. 在这里，太低的DOL值将导致不足的淬灭，这将损坏剂量响应的幅度，而太高的DOL值将损害AF594的激发，因为HMCVl也在AF594的激发波长处吸收。 Here, too low a value will lead to insufficient DOL quenching, which will damage the magnitude of dose response, and the high value of the DOL will inspire AF594 damage, because the absorption wavelength of the excitation of HMCVl also AF594. 参考图6A，注意，实际上有在上述光学传感器的操作中涉及的三个单独的平衡。  Referring to Figure 6A, note that there are actually three separate balance involved in the operation of the optical sensor. 第一个平衡是在间质流体中的葡萄糖和传感器隔室内部的葡萄糖之间的平衡，其由渗透压力，即，在ISF中和传感器隔室内部的葡萄糖浓度中的差异调节。 The first balance is the balance between glucose and the glucose sensor inside the compartment in the interstitial fluid, the osmotic pressure thereof, i.e., the difference in glucose concentration in the ISF and the inside of the compartment sensor adjustment. 第二个平衡是在与MBL交互作用的葡萄糖和自由葡萄糖之间的平衡，其主要由葡萄糖和MBL之间的亲合力调节。 The second balance is the balance between the interaction and the MBL consisting of glucose and glucose, which is mainly regulated by pro force between glucose and the MBL. 第三个平衡是在MBL和葡聚糖之间的平衡，其由葡聚糖和MBL之间的亲合力以及传感器隔室内部的葡萄糖的浓度调节。 The third balance is the balance between MBL and dextran, which is regulated by glucose concentration and the affinity between the dextran and MBL compartment inside the sensor. 所有三个平衡都是动态的和可逆的。  All three are dynamically balanced and reversible. 这意味着，相同的葡萄糖分子可以在一个时刻与MBL分子交互作用，而在下一时刻不与MBL交互作用，以及在第三时刻穿越传感器膜， 离开传感器隔室并进入ISF中。 This means that the glucose molecule may be the same MBL molecule interactions at a time, but does not interact with MBL at the next moment, and the third time through the sensor film, away from the sensor and into the compartment in the ISF. 在试样化学成分（MBL-AF594和葡聚糖-HMCV1)之间的交互作用在任何时间反映在传感器隔室中的葡萄糖的浓度。 Interaction between the chemical composition of the sample (MBL-AF594 and dextran -HMCV1) at any time is reflected in the sensor compartment concentration of glucose. 可能潜在地损害传感器的渗透性的传感器的淤积可能延长对ISF中的葡萄糖浓度的变化的响应时间，但不干扰传感器中的葡萄糖测量。 Deposition sensor could potentially damage the permeability sensor may increase the response time to changes in glucose concentration in ISF, but does not interfere with the glucose measurement sensor. 也就是说，试样化学过程总是测量传感器隔室内部的正确的葡萄糖浓度。 That is, the measurement sample is always correct chemical processes inside the sensor glucose concentration compartment. 简而言之，传感器的淤积对传感器内部的平衡没有影响。 Briefly deposition, no effect on the balance of the sensor inside the sensor. 而且，涉及葡萄糖的所有平衡完全是可逆的，且因此葡萄糖在测量过程不被消耗。 Moreover, all the glucose balance relates entirely reversible, and therefore is not consumed in glucose measurement. 其中j是葡萄糖流量，D是扩散常数，C = [Glu]，且X是距离。  wherein j is glucose flux, D is diffusion constant, C = [Glu], and X is the distance. 生物淤积改变传感器膜的厚度（dx)，因而减小葡萄糖流量和所测量的传感器响应。 Biofouling changing the thickness of sensor membrane (dx), thus reducing the flow rate and the measured glucose sensor response. 因此，传感器重新校准将是需要的。 Thus, the sensor will be required recalibration. 因为MBL和葡聚糖浓度在传感器内部是固定的，K只取决于葡萄糖浓度。  Since dextran and MBL concentrations in the sensor is fixed, K depends only on the glucose concentration. 因为生物淤积出现在膜外部，反应的平衡未被影响。 Because biofouling appear outside the membrane, the equilibrium reaction is not affected. 实验数据确认上面提到的结果。 Experimental data confirm the results mentioned above. 参考图5,用于询问上述感测元件（试样）的光学系统本质上是修改的荧光显微镜机构，其具有一个光源来激发（即，照亮）试样和两个检测器来分别检测从试样和内部参考物发射的荧光。  Referring to FIG 5, means for interrogating a fluorescence microscope essentially on said sensing element (sample) is a modification of an optical system having a light source excitation (i.e., illuminated) two detectors and the sample separately detecting fluorescence emitted from the sample and the internal reference material. 如所提到的，发射荧光的强度与葡萄糖浓度相关。 As mentioned, the intensity of fluorescence emission associated with the glucose concentration. 在这里，发射荧光的所测量的强度被光源的强度以及试样和光学系统之间的耦合影响。 Here, the measured intensity of the fluorescence emission intensity of the influence of coupling between the light source and the sample and the optical system. 因此，强度测量要求内部参考荧光团合并到试样中。 Thus, intensity measurements requires an internal reference fluorophores incorporated into the sample. 参考焚光团必须以下列方式不同于试样焚光团：来自试样的发射焚光和来自参考物的发射荧光可例如通过具有不同的吸收光谱或发射光谱而彼此分离。  The group must be different from the reference sample light burning burning light group in the following manner: the light emitted from the sample emitted fluorescence from the burning of the reference object, for example, may be separated from each other by having different absorption or emission spectra. 参考荧光团可以是例如被标记到人类血清白蛋白（HAS)或大部分不结合到葡萄糖受体的另一大分子上的Alexa Fluor700(AF700)。 Reference fluorophore may be tagged to, for example, human serum albumin (HAS) or most are not bonded to Alexa Fluor700 (AF700) on the other receptor molecules of glucose. Alexa Fluor700 可与Alexa Fluor594 同时被激发，因为它们的吸收光谱在光谱上重叠。 Alexa Fluor700 can be simultaneously excited and Alexa Fluor594, because their absorption spectra superimposed on the spectra. 来自Alexa Fluor700的发射光谱相对于Alexa Fluor594稍微红色偏移，这使在不同的波长区中检测它们的相应荧光发射变得可能。 Alexa Fluor700 from the emission spectrum with respect to Alexa Fluor594 red shifted slightly, so that their respective fluorescence emission detection becomes possible in a different wavelength region. 试样和参考物的发射荧光的激发以及检测遵循从光学系统到试样的同一光路。  sample fluorescence excitation and emission and the detection reference object follows the same optical path from the optical system to the sample. 因此，来自参考物的检测到的信号用作在光学询问系统和试样之间的光耦合的度量。 Thus, the detected signal is used as a measure of the reference object from the optical coupling between the optical system and the interrogation of a sample. 起源于光耦合（例如对准）的变化的任何效应可被抵消。 Optical coupling effect of any origin (e.g., aligned with) a change can be canceled. 参考图5,在本发明的实施例中，驱动器电路1310以具有能够同时激发试样和参考荧光团的波长范围的低频率调节LED1320,目的仅仅是消除Ι/f噪声并抵消环境光。  Referring to FIG 5, in the embodiment of the present invention, the driver circuit 1310 having a low frequency is possible to excite the sample and reference wavelength range of the fluorophore adjustment LED1320, the sole purpose of eliminating Ι / f noise and offset of ambient light . 使用多层电介质滤波器过滤LED输出以选择不同的波长区。 Multilayer dielectric filter using the filter output to select a different LED wavelength region. 过滤后的LED输出被第一二色性分束器1340反射并通过透镜1350聚焦到包括试样和参考物的传感器1300上。 LED output filtered by the first dichroic beam splitter 1340 and reflected and focused onto the sample comprises a reference sensor 1300 by a lens 1350 material. 试样和参考物发射荧光。  sample and the reference material emit fluorescence. 所发射的荧光1301和所反射的激发光1323由透镜1350 拾取并准直。 The emitted fluorescence excitation light 1323 and 1301 is reflected by the pickup 1350 and the collimator lens. 第一二色性分束器1340发射荧光1301。 The first dichroic beam splitter 1340 1301 emits fluorescence. 然而，它反射大部分背反射的激发光1323。 However, it reflects most of the excitation light is reflected back 1323. 第二分束器1344在90°角1307下反射参考荧光，但它透射试样荧光1309。 Second beam splitter 1344 in 1307 at a 90 ° angle of the reflected reference fluorescence, but it transmits 1309 the sample fluorescence. 具有相对于激发滤波器的通带红色偏移且不与激发滤波器的通带重叠且匹配试样荧光光谱的期望部分的不同的波长区的第一发射滤波器1360则阻挡激发光的其余部分并透射试样荧光。 With the rest of the excitation light with respect to the excitation filter passband offset and do not overlap with the red band pass excitation filter and a first matched filter 1360 different emission wavelength region of a desired portion of the fluorescence spectrum of the sample block and transmitting the sample fluorescence. 类似地，具有相对于激发滤波器的通带红色偏移且不与激发滤波器的通带重叠且匹配试样荧光的期望部分的不同的波长区的第二发射滤波器1364阻挡激发光的其余部分并透射参考荧光1307。 Second transmit filter 1364  Similarly, a different desired wavelength region of the excitation portion with respect to the red filter passband offset and do not overlap with the pass band excitation filter and matching sample fluorescence excitation barrier the remainder of the reference light and transmits fluorescence 1307. 因此，实际上，使用相应的透镜1370U374将仅来自试样的荧光和来自参考物的荧光聚焦到其相应的光电检测器1380、1384上。 Thus, in practice, use of the corresponding lens 1370U374 only fluorescence from the fluorescence from the reference sample and was focused onto its respective photodetector 1380,1384. 在检测到的试样荧光和检测到的参考荧光之间的比与试样中的葡萄糖浓度相关。 Related to the glucose concentration in the sample between the sample and the ratio of the fluorescence detected and the detected fluorescence of the reference. 上述光传感器技术提供优于其它可用技术的几个优点。  The optical sensor technology offers several advantages over other available techniques. 例如，如前所述，由于试样的非消耗和稳定性质，测量技术对生物淤积是不敏感的。 For example, as described above, since the non-consumable and stability properties of the sample, the measurement technique is not sensitive to biofouling. 因此，它提供在传感器的整个寿命中单一点校准的可能性。 Thus, it offers the possibility of single point calibration over the life of the sensor. 此外，试样包含参考染料，参考染料相对于变化的葡萄糖浓度保持稳定，但被很多非葡萄糖引起的变化影响。 Further, the reference sample containing the dye, with respect to a reference dye concentration change of glucose remained stable, but the influence caused many variations are non-glucose. 因此，它用作光学传感器的传感器诊断工具，指示何时膜的整体性被损害或光连接失准。 Thus, it is used as an optical sensor diagnostic tool sensor, indicating when the membrane integrity is compromised misalignment or optical connections. 见例如图6B。 See e.g. Fig. 6B. 此外，如下面将进一步描述的，试样可包括保护性配剂，该保护性配剂适合于辐射灭菌一一一种用于葡萄糖传感器的常见灭菌技术。 Furthermore, as will be described further below, the sample may include a protective formulation, the formulation suitable protective sterilized one hundred eleven kinds of radiation sterilization techniques commonly used for the glucose sensor. 而且，葡萄糖受体MBL是源于人的蛋白质。  Moreover, the glucose receptor MBL is a protein derived from human. 因此，没有免疫响应。 Therefore, no immune response. 而且，MBL可起源于等离子体或重组地产生。 Further, MBL may originate from plasma or recombinantly produced. 此外，与可用于基于平衡的葡萄糖感测的其它蛋白质比较，MBL 具有经过证明的生物相容性且在临床上用于制药目的。 Further, for comparison it may be based on a balance of the other proteins glucose sensing, after having biocompatibility of MBL and proven clinically used for pharmaceutical purposes. 表5示出在MBL和用于基于平衡的葡萄糖传感器的其它葡萄糖结合剂之间的已知差异。 Table 5 shows the difference between other known dextrates balance and glucose sensor based on the MBL. 返回到用于正交冗余感测的连续葡萄糖监测系统，现在将更详细地描述图IA和IB所示的几个元件/部件。  Back to the continuous glucose monitoring system for sensing orthogonal redundancy, several components will now be described and illustrated in FIG. IA IB / member in detail. 电化学传感器200是最新技术的电化学传感器，例如Enlite3(第三代Enlite传感器，Medtronic公司）。  The electrochemical sensor is an electrochemical sensor 200 of the latest technology, e.g. Enlite3 (Third Generation Enlite sensor, Medtronic, Inc.). 如图7所示，Enlite3植入式传感器特征在于，分布式感测电极设计，其中感测电极210沿着传感器的长度分布以减小对传感器性能的局部组织影响，以及优化的无溶剂化学性质以提高一致性。 7, Enlite3 implanted sensor wherein the sensing electrode design distributed, wherein the sensing electrodes 210 along the length of distribution sensor to reduce local effects on the sensor performance of the organization, and optimization of the chemical properties of the solvent-free to improve consistency. 在本发明的实施例中，电化学传感器可由无塑料管子的柔性聚酰亚胺材料组成。 In an embodiment of the present invention, the electrochemical sensors may be non-flexible polyimide tube of plastic material. 如前所述和在图8A和8B中示出的，正交冗余传感器包括光纤传感器100。  As described above and in FIGS. 8A and 8B illustrated, the orthogonal sensors 100 comprises a fiber optic sensor redundancy. 光纤传感器100具有在光纤的远端115处/附近附有可渗透葡萄糖膜120的光纤110。 The optical fiber sensor 100 has at / near the distal end of the optical fiber 115 with a glucose permeable membrane fiber 110 120. 在本发明的实施例中，光纤110由具有确保鲁棒性的拉伸和疲劳特性的塑料制成。 In an embodiment of the present invention, the optical fiber 110 is made to ensure robustness having tensile and fatigue properties of the plastic. 可渗透葡萄糖的膜120可例如热密封在光纤的远端115上。 Glucose-permeable membranes 120 may be, for example, heat-sealed on the distal end 115 of the optical fiber. 在本发明的实施例中，膜120可优选地由生物相容的、生物可降解的聚合物例如P〇lyActive™(Integra Orthobiologics，Irvine，CA)制成。 In an embodiment of the present invention, the film 120 may preferably be biocompatible, biodegradable polymers such P〇lyActive ™ (Integra Orthobiologics, Irvine, CA) is made. 可渗透葡萄糖的膜120容纳试样化学物质125。  glucose-permeable membrane 120 receiving sample 125 chemicals. 光纤110的尺寸被优化以便提高水合作用和响应时间以及减小植入物和用于将光纤引入到患者的身体内的针头的尺寸。 Size fiber 110 is optimized so as to increase hydration and reduce response time and implant and the size of the fiber for introducing the needle in the body of the patient. 如也在图8A和8B中示出的，激发光130从光纤的近端117传播到试样化学物质125,且荧光响应140沿着光纤传播回到位于例如图IA和IB中所示的发射机10中的光学询问系统。 As FIGS. 8A and 8B is also shown, the excitation light 130 propagates from the proximal end of the optical fiber 117 to the sample 125 chemicals, and the fluorescence emission response shown in FIG. IA and IB are propagated back along the fiber 140 is located e.g. the optical interrogation system of the machine 10. 发射机10包括光学传感器100和电化学传感器200的仪器。  The transmitter 10 comprises an optical instrument 100 and a sensor 200 is an electrochemical sensor. 对于光学传感器，这样的仪器可包括例如光源、检测器、光学驱动电子设备和光学询问系统的其它元件/部件(分立的或集成的）。 For the optical sensor, for example, such an apparatus may comprise a light source, detector, optical drives other elements / components of the electronic devices and optical interrogation system (discrete or integrated). 对于电化学传感器，仪器可包括例如恒电势器和其它相关的部件（也是分立的或集成的）。 For electrochemical sensors, the instrument may include a potentiostat and other related components (also discrete or integrated). 如图9A和9B所示，发射机10还包括双重连接器20,其允许两个传感器元件100、200分开地连接到所需的仪器。 Shown in FIGS. 9A and 9B, the transmitter 10 further comprises a dual connector 20, which allows the two sensor elements 100 and 200 are separately connected to the desired device. 在双重连接内，电化学连接可允许多达四个隔离的触头，并且可以是防水的。 In the dual connections, the connection may allow up to four electrochemical isolating contacts, and may be waterproof. 类似地，光连接可以防水的和/或提供在光表面之间匹配的一致的指标。 Similarly, the optical connector can be waterproof and / or provide a consistent index matching between the light receiving surface. 在这里，虽然直接接触可能不是需要的，但光路必须是清楚的。 Here, although direct contact may not be needed, but the light path must be clear. 此外，发射机容纳诊断、一个或多个微处理器和/或数字信号处理器（DSP)、存储器、RF通信芯片（使用例如2. 4GHz TelD协议）和电池以支持传感器的测量功能、从传感器接收的信号到葡萄糖值的转换、以及无线通信，包括葡萄糖值（或其平均、加权或否则修改的版本）到例如监测器300、输液栗400、显示设备等的传送。  In addition, the transmitter receiving the diagnosis, one or more microprocessors and / or digital signal processor (DSP), memory, the RF communication chip (for example, 2. 4GHz TelD protocol) and to support the battery sensor measurement function , the signal received from the sensor to the glucose value conversion, and a wireless communication, including glucose value (or an average, weighted or otherwise modified versions) to monitor, for example, 300, 400 infusion Li, a display or the like transfer device. 发射机10还容纳利用预测性诊断和信号比较来评估信号可靠性的算法。  The transmitter 10 further accommodates the use of diagnostic and predictive signal comparison signal to assess the reliability of the algorithm. 算法以智能启动和校准方案为特征，使得传感器性能指示校准何时是需要的。 Smart Start algorithm and calibration scheme is characterized such that the sensor performance is needed indicating when the calibration. 此外，算法使个体信号到所计算的葡萄糖数的转换开始操作，葡萄糖数被传送到上面提到的一个或多个设备。 Further, an individual signal to the algorithm converts the number of calculated start operation glucose, the glucose is transferred to one or more of the number of devices mentioned above. 发射机10是耐用设备，且因此相关的电池可以是可再充电的。  Transmitter 10 is a durable equipment, and thus associated battery may be rechargeable. 在这些实施例中， 发射机可能需要对所包含的电池的间歇再充电。 In these embodiments, the transmitter may need to recharge the batteries contained in the batch. 因此，本发明的优选实施例包括结合发射机（电池）来使用的充电器。 Accordingly, the preferred embodiment of the present invention include a combination of a transmitter embodiment (cell) charger is used. 此外，充电器可在需要时针对正确的功能测试发射机。 In addition, the charger for proper function test transmitter when needed. 注意， 在本发明的实施例中，容纳在发射机10中的一些或全部元件/部件可被集成，以便使设备小型化。 Note that, in the embodiment of the present invention, some or all of the elements in the received / member 10 may be integrated in the transmitter, so that the apparatus can be miniaturized. 在这个方面，可使用印刷电路板组件（PCBA)。 In this aspect, the use of printed circuit board assembly (PCBA). 插入设备500用于植入传感器100、200,以便最小化外伤并最大化患者舒适度和传感器输送的一致性。  500 is inserted into the device for implantation sensors 100 and 200, to minimize trauma and maximize patient comfort and conformance of the sensor delivery. 见图10。 See Figure 10. 插入设备依赖于一次性自动伸缩式针头510,针头510设计有传感器基底以穿过用户的皮肤输送传感器1〇〇、200。 Depends on the disposable device is inserted automatically retractable needle 510, the needle 510 is designed with a sensor base to the skin of the user through the conveyance sensor 1〇〇, 200. 具体地，光学传感器100和电化学传感器200协同定位在针头内部，且因此被同时插入。 Specifically, an electrochemical sensor 100 and the optical sensor 200 co-located within the needle, and is therefore inserted simultaneously. 电化学传感器200通常包括薄和宽的柔性衬底。  The electrochemical sensor 200 typically comprises a thin flexible substrate and wide. 因此，它可位于针头510的开口和光纤传感器100之间以帮助存留。 Thus, it may be located between the opening 100 and the needle 510 to aid retention fiber sensor. 光纤传感器的直径可大至大约500 μ m，但优选地小于200 μ m。 The diameter of the optical fiber sensor may be as large as about 500 μ m, but preferably less than 200 μ m. 注意，在图10中，针头510被示为在0°下（即，水平地）。 Note that, in FIG. 10, the needle 510 is shown at 0 ° (i.e., horizontally). 然而实际上，针头510 在90 °C下被插入。 In practice, however, the needle 510 is inserted at 90 ° C.
 如从图9A、9B和10清楚的，在本发明的实施例中，电化学传感器和光学传感器的衬底可被分开地制造并单独地组装成单个传感器壳体（例如发射机10)的单个基底。  As in FIG. 9A, 9B and 10 is clear, in the embodiment of the present invention, the substrate of the electrochemical sensor and the optical sensor may be separately manufactured and assembled separately into single sensor housing (e.g., the transmitter 10 ) single substrate. 这两个传感器接着插入单插入设备500内。 Both sensors then inserted into a single device 500 is inserted. 然而，虽然插入设备将两个传感器衬底部署在一起， 衬底并不连接在植入物区域中。 However, although the device is inserted into the deployed together two sensor substrate, the substrate is not attached to the implant area. 电化学传感器（探针）和光学传感器（探针）然而可协同定位在体内。  The electrochemical sensor (probe) and an optical sensor (probe) may be co-located in the body, however. 在这个方面，发现了，传感器之一的性能没有被在极接近区域内的其它传感器的存在影响。 In this respect, we found that the performance of one of the sensor is not in close proximity in the presence of the other sensors in the impact area. 例如，光学传感器探针的存在不遮蔽或妨碍葡萄糖到达电化学传感器（探针）。 For example, the presence of the optical sensor probe does not obscure or interfere with the glucose reaches the electrochemical sensor (probe). 类似地，作为电化学传感器与葡萄糖的反应的副产物产生的过氧化物不影响光学传感器的性能。 Similarly, a peroxide as a reaction byproduct electrochemical glucose sensor produced without affecting the performance of the optical sensor. 甚至在过氧化物的高浓度例如12ppm(即，等效于对电化学传感器的400mg/dL葡萄糖响应）下，过氧化物被发现对光学传感器响应没有影响。 For example, even 12ppm (i.e., equivalent to 400mg / dL glucose in response to the electrochemical sensor) a high concentration of peroxide, was found to have no effect on the response of the optical sensor. 图9C示出替代的实施例，其中电化学传感器和光学传感器的衬底被集成，以便形成集成柔性电路。  FIG. 9C shows an alternative embodiment in which the substrate is an electrochemical sensor and an optical sensor are integrated to form an integrated flexible circuit. 也可被称为"身体上控制器"或"身体上发信机（OBC) "的手持监测器300可包括用于校准的集成血糖仪320。  may also be referred to as "physical controller" or "physical transceiver (an OBC)" handheld monitor 300 may include an integrated blood glucose meter 320 for calibration. 在手持监测器300内的算法提供误差校验以确保不准确的血糖读数不被传递。 Algorithm in the handheld monitor 300 provides an error checking to ensure that an accurate blood glucose reading is not transmitted. 这个误差校验的包括具有潜力来降低MARD并因此明显提高准确度，因为用于校准的不正确的仪表点可能错误地升高或降低所计算的葡萄糖水平。 This potential for error checking include MARD and thus reducing significantly improved accuracy because of incorrect meter calibration point may be erroneously used to raise or lower the calculated glucose levels. 见例如图11。 See e.g. FIG. 11. 在上面描述的连续葡萄糖监测（CGM)系统中，使用两种独特的感测技术的正交冗余提供增加的准确度和可靠性，同时使环境影响能够被考虑到。  Continuous glucose monitoring described above (CGM) system, using two unique redundant orthogonal sensing technologies provide increased accuracy and reliability, while enabling the environmental impact to be taken into account. 具体地，关于准确度， 本发明的实施例实现大约13 %的MARD。 Specifically, with respect to accuracy, embodiments of the present invention to achieve approximately 13% MARD. 在这个方面，应理解，现有的血糖仪（即，手指针刺）家庭内使用型号被预期具有通常高的准确度；也就是说，接近9%的MARD，按照IS015197:2003,所有点的95%被预期是准确的。 In this regard, it should be understood that the existing blood glucose meter (ie, finger stick) home use models are generally expected to have a high degree of accuracy; that is, nearly 9% of MARD, in accordance with IS015197: 2003, all points 95% are expected to be accurate. 在后一标准下，如果它对于至少95%的所测试的样本满足下面的标准，则仪表被认为是准确的：（1)对于低于75mg/dl的血糖水平， 监测器读数必须在参考的15mg/dl内；以及对于75mg/dl或更高的读数，监测器读数必须在参考读数的20%内。 In the latter criterion, if it meets the following criteria for at least 95% of the samples tested, the meter is believed to be accurate: (1) for less than 75mg / dl glucose levels, the monitor must be read with reference to the 15mg / DL within; and for 75mg / dl or more readings, the readings must monitor reference reading of 20%. 创造性系统的正交冗余还允许远远超过任一感测部件的单独可靠性的组合可靠性。 Orthogonal redundancy  The inventive system also allows for much more than any one component alone sensing reliability combination reliability. 具体地，如下面进一步讨论的，具有75%的ISO准确度的两个正交传感器在组合时将在理论上具有时间的93. 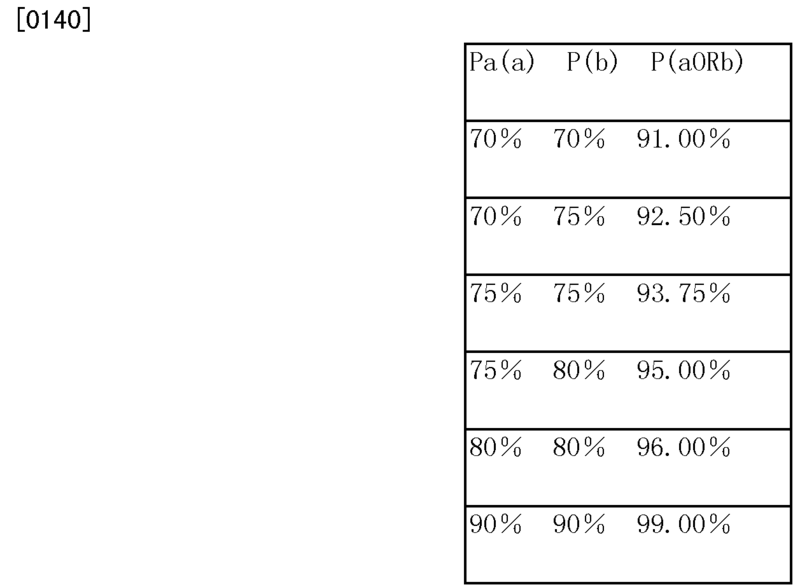 75%准确度。 Specifically, as discussed further below, with 93.75% accuracy of two orthogonal sensors 75% ISO with a time accuracy will theoretically when combined. 冗余增加了所显示的时间数据的准确度和百分比。 Redundancy and increase the percentage of time the accuracy of the displayed data. 可靠的系统要求，（1)数据尽可能经常地被显示，同时（2)只在数据是准确的时显示它。  reliable system requirements, (1) the data to be displayed as often as possible, while (2) the data is accurate only when it is displayed. 注意，使用对传感器技术的改进和故障检测算法，传感器系统的准确度将明显提高。 Note that using the improved fault detection algorithm and sensor technology, the accuracy of the sensor system will be significantly improved. 然而，太敏感的故障检测算法可能将所显示的数据的量减小到用户不可接受的程度。 However, fault detection algorithms may be too sensitive to the amount of the displayed data is reduced to an unacceptable extent the user. 在这个方面，构成本文描述的感测平台的可靠性的两个组分是：（1)数据显示（时间的％)和(2)准确度（时间的％ )。 In this regard, sensing platform configuration described herein is the reliability of the two components: (1) data (% of time) and (2) Accuracy (% of time). 本发明的系统对94%的传感器满足下面的可靠性要求：（1)它显示传感器佩戴"校准"时间的传感器数据90% ;以及⑵它满足对93. 75 %的所显示的采样点的IS015197:2003要求。  The system of the present invention is 94% below the sensor satisfy reliability requirements: (1) It displays the sensor data wear sensor "Calibration" time of 90%; and ⑵ it meets the sampling of displayed 93.75% IS015197 points: 2003 requirements. 注意，一些现有的传感器技术当前可满足上面的第一标准，但关于第二要求，需要明显的改进以便实现按照IS015197:2003的仪表附近等效性。 Note that some of the prior art current sensor can satisfy a first criteria above, but for the second requirement, the need to achieve a significant improvement according to IS015197: 2003 near equivalence of the instrument. 现有的传感器技术公开了大约70%的准确度，意味着根据IS015197:2003标准， 所有评估的CGM点的70%被认为是准确的。  The prior art discloses a sensor about 70% accuracy, which means according to IS015197: 2003 standard, all the evaluation points CGM 70% is considered to be accurate. 因此，假设具有传感器误差出现的随机分布的大致相等的准确度的两个感测部件（即，假设两个感测部件并不总是同时不准确地读出）， 准确度的明显增加可实现，假定系统能够快速识别在一个或另一感测部件中的可能错误。 Thus, assuming a sensor having two sensing errors occurring members of substantially equal accuracy of randomly distributed (i.e., assuming two sensing members are not always read out accurately without), a significant increase in accuracy can be achieved , assumed that the system can quickly identify one or another sensing member may be an error. Sl是感测部件1 (例如光学传感器）的所有评估点的集合。  Sl is set (e.g., optical sensors) all evaluation point sensing member 1. S2是感测部件2 (例如非光学传感器）的所有评估点的集合。  S2 is (e.g. non-optical sensor) of the set of evaluation points for all the sensing member 2. Sl和S2是独立的、正态分布的变量（由于传感器正交性）。  Sl and S2 are independent, normally distributed variables (since the sensor orthogonality). P (a)、P (b)代表任何这样的点被认为是准确的概率。  P (a), P (b) represents any point of such a probability is considered to be accurate. 使用两个传感器，其中p(a) = p(b) = 0. 7,P(a OR b) = 0. 7+0. 7 - (0. 7x0. 7)= 0. 91 (即，在91 %的点上的准确度）。  Using two sensors, wherein p (a) = p (b) = 0. 7, P (a OR b) = 0. 7 + 0 7 -. (. 0. 7x0 7) = 0. 91 ( in other words, 91% accuracy on the point). 因此，在这个基线上的任一感测部件的准确性能的任何增加也提高了总系统的准确度。 Thus, any increase in the accurate performance of any of the baseline is also a sensing member to improve the accuracy of the overall system. 表6显示对正交冗余系统的个体准确度影响，假设在两个感测部件之间有真实独立性。 Table 6 shows the effect of the individual orthogonal redundant system accuracy, assuming there is a real sense of independence between the two members. 如所提到的，预期组合准确度基于对一个或两个感测部件的在准确度上的预期提高，以便实现93. 75%的准确度而不牺牲有用的传感器寿命，且假设完全的独立性。  As mentioned, the combination is expected based on the expected accuracy of the sensing of one or two members improve accuracy in order to achieve 93.75% accuracy without sacrificing useful life of the sensor, and assuming that complete independence. 在本发明的优选实施例中，其中两个感测部件之一是光学葡萄糖传感器，且非光学传感器是电化学葡萄糖传感器，可影响光学和电化学感测技术的完全独立性的一些因素包括例如下列内容：（1)单个植入物内的传感器协同定位并不考虑生理效应（即，作为插入部位上的增加的压力的结果的降低的间质流体葡萄糖浓度）；以及（2)两个感测部件的同时校准依赖于从参考点（例如仪表手指针刺）的准确度的预期，使得如果不被系统正确地识别，来自参考点的相当大的误差可传播到传感器葡萄糖计算中，导致两个感测部件的传感器准确度的畸变。 Complete independence of the factors in the preferred embodiment of the present invention, wherein one of the two sensing means is an optical glucose sensor, and a non-optical sensor is an electrochemical glucose sensor, may affect the optical and electrochemical sensing technologies include e.g. the following: (1) co-located within a single sensor implant is not considered physiological effect (i.e., decrease as the increased pressure on the insertion site results interstitial fluid glucose concentration); and (2) two sense simultaneously calibrate the member depends on the intended accuracy from the reference point (e.g., fingerstick meter), so that if the system is not correctly recognized, considerable error may propagate from the reference point to calculate a glucose sensor, resulting in two sensor means sensing accuracy of distortion. 由于个体剂量响应，组合光学传感器和电化学传感器产生具有在低血糖和高血糖范围内的高精确度的感测系统。  Since the individual dose response, a combination of optical sensors and electrochemical sensors produced with accuracy in the low range and hyperglycemia high sensing system. 图12示出光学平衡葡萄糖传感器和电化学葡萄糖传感器的剂量响应函数（即，在传感器输出和葡萄糖剂量之间的相关性）。 FIG. 12 illustrates an optical sensor and a balance of glucose dose response function of an electrochemical glucose sensor (i.e., the correlation between the sensor output and the glucose dose). 光学传感器以低血糖区中的较陡斜率133为特征，导致较高的精确度，而电化学传感器具有线性斜率233,导致在高血糖区中的较高精确度。 The optical sensor at a relatively steep slope hypoglycemia region 133 is characterized, resulting in high accuracy, while the electrochemical sensor 233 having a linear slope, resulting in higher accuracy in the hyperglycemic region. 葡萄糖监测设备的已确认的准确度标准允许在低血糖区中的较高百分比误差，因为临床治疗决策保持相同，而不管低血糖严重性如何。 Has confirmed the accuracy of the standard  glucose monitoring devices allow hypoglycemia zone a higher percentage of error, because the clinical decision making remains the same, regardless of the severity of low blood sugar. 在闭环系统中，在血糖漂移（低血糖或高血糖范围）中的传感器性能变得日益重要，因为这样的系统不仅依赖于漂移准确度， 而且依赖于背景趋向数据作为控制算法的重要反馈输入。 In a closed loop system, sensor performance in glucose excursions (hypoglycemia or hyperglycemia range) becomes increasingly important, not only because such a system depends on the accuracy of the drift, but also on the background tends input data as an important feedback control algorithm. 根据本发明的实施例的正交冗余传感器提供在低血糖和高血糖性能方面的益处。  provides a benefit in a low performance and hyperglycemia according to an embodiment of the redundant sensors orthogonal to the present invention. 两个葡萄糖传感器具有可提高低血糖和高血糖性能的不同的剂量响应曲线。 Glucose sensor having two different low dose may improve performance and hyperglycemic response curve. 平衡传感器的剂量响应函数不是线性函数，而是当接近Omg/dL的葡萄糖浓度时具有最陡的斜率的曲线形状的函数。 Dose balance sensor response function is not a linear function, but the function curve shape having a steepest slope of the glucose concentration when approaching Omg / dL of. 剂量响应中的斜率越陡，传感器的精确度就越高。 The slope of the steeper dose response, the higher the accuracy of the sensor. 因此，基于亲合力的葡萄糖传感器通常具有比高敏感度更好的低敏感度，与电化学传感器相反，其中剂量响应函数是线性函数，导致相等的低和高敏感度。 Thus, affinity-based glucose sensor having low sensitivity is typically better than high sensitivity, as opposed to an electrochemical sensor, wherein the function is a linear function of the dose response, resulting in low and high sensitivity equal. 组合光学传感器和电化学传感器因而产生具有在低范围中和高范围中的精确度的感测系统。 A combination of an optical sensor and an electrochemical sensor having a thus produced in a low range and high accuracy in a range of sensing system. 如前所述，Hovorka提议，对于闭环应用，在10-15 %之间的MARD将是合乎需要的，具有朝着过低估计而不是过高估计的偏好。  As described above, Hovorka proposed for closed-loop applications, The MARD between 10-15% will be desirable, rather than having towards underestimation overestimation preference. 而且，临床和实验室标准协会（P0CT05-P， "Performance Metrics for Continuous Glucose Monitoring !Proposed Guideline'，， CLSI)提出了如下的对家庭使用低血糖敏感度、特异性和假警报率（对于连续间质葡萄糖监测）的定义：⑴敏感度：对于低于70mg/dl的任何仪表读数，敏感CGM系统也应在参考样本的+/-30分钟内读70mg/dl或更低；（2)特异性：对于任何血糖正常仪表读数（不是低血糖或高血糖），也在这个范围内的CGM读数被认为是真正的负数；以及（3)假警报：对于高于85mg/dl的任何仪表读数，此时在70mg/dl或更低处读出的任何CGM读数将被认为是假警报。敏感度/特异性度量允许对由与闭环控制最相关的CGM系统提供的背景数据的考虑。 Moreover, the Clinical and Laboratory Standards Institute (P0CT05-P, "Performance Metrics for Continuous Glucose Monitoring! Proposed Guideline ',, CLSI) proposed the following for home use of low blood sugar sensitivity, specificity and false alarm rate (for continuous between interstitial glucose monitoring) definition: ⑴ sensitivity: for any meter readings below 70mg / dl, the system should be sensitive CGM read 70mg / dl or less in the reference sample +/- 30 min; (2) specific : for any normal blood glucose meter reading (not a low blood sugar or high blood sugar), but also CGM readings in this range is considered to be a real negative; and (3) a false alarm: for any meter higher than 85mg / dl reading, this any CGM readings read in 70mg / dl or less would be considered at a false alarm. the sensitivity / specificity measures allow for the consideration of the background data provided by the closed-loop control of the most relevant CGM system. 在本发明的实施例中，正交冗余感测系统满足具有至少95%的敏感度和特异性及低于10%的假警报出现率的13%的低血糖MARD。  In an embodiment of the present invention, the orthogonal redundant sensing system has to meet the 13% hypoglycemia MARD at least 95% sensitivity and specificity and less than 10% occurrence rate of false alarms. 在正交冗余系统中的每个传感器的独立准确度在大部分情况下满足这个要求，特别是假定正交冗余允许在边缘上的信号的消除， 进一步提高敏感度/特异性和假警报。 The accuracy of each sensor is independently in an orthogonal redundant system meet this requirement, in most cases, in particular assuming an orthogonal redundancy allows cancellation signal on the edge, to further improve the sensitivity / specificity and false alarm . 根据本发明的实施例的正交冗余感测系统还通过个体传感器预热时间的优化而提供预热时间的减少。  further reduce the warm-up time provided by optimizing the individual sensor warm-up time based on orthogonal redundancy sensing system of the embodiment of the present invention. 通过利用可预测的磨合（run-in)行为和启动诊断作为算法的输入以创建自适应预热来减少被定义为直到传感器信号对执行第一校准来说足够稳定为止的时间的总系统启动时间。 By using a predictable running (run-in) acts as an input and start the diagnostic algorithm to create an adaptive warm-up to reduce the time until the sensor is defined to perform a first calibration signal is sufficiently stable until the overall system startup time . 减少传感器启动时间对系统的准确度和可靠性以及用户的方便是重要的，因为它允许患者在插入传感器之后不久完成手指针刺校准。 Reducing the accuracy and reliability of the sensor and the convenience of the user of the system startup time is important because it allows the patient to be completed shortly after the insertion of the sensor calibration fingerstick. 关于个体传感器启动时间的最小化，可优化电化学传感器的化学层，且可在正交冗余传感器中使用新的初始化方案。  minimize start-up time on the individual sensor, a chemical layer can be optimized electrochemical sensors, and may use the new initialization program orthogonal redundant sensors. 对于光学传感器，（试样）化学物质的水合可加速，且可针对最大的表面积与体积比来优化设计。 For the optical sensor, (Sample) may accelerate the hydration of chemical substances, and may be for the maximum surface area to volume ratio to optimize a design. 也可将吸引并保留来自大气的水分子的吸湿剂或化学物质（例如糖、蜂蜜和某些盐）添加到试样。 Can also attract and retain moisture absorbent chemicals or water molecules from the atmosphere (such as sugar, honey, and certain salts) were added to the sample. 获得快速启动时间的主要障碍之一是从光纤传感器内部移除空气。 One  The main obstacles for fast start-up time is to remove air from the interior of the optical fiber sensor. 在这方面，已发现，将糖、碳酸氢盐和酶的组合添加到传感器（的试样）在大约30分钟内从传感器得到大约90%的空气。 In this regard, it has been found, adding sugar, a combination of bicarbonate and enzymes to the sensor (sample) to obtain about 90% of the air from the sensor in about 30 minutes. 通过优化上面标识的组合的比例构成，启动时间的进一步减少可以是可能的。 By optimizing the combination ratio of the above-identified configuration, further reduction of the startup time may be possible. 类似地，已发现，较小直径的光纤传感器提供磨合时间的减少。  Similarly, it has been found that the smaller the diameter of the optical fiber sensor is provided to reduce the run time. 例如，用250 μπι直径的光纤代替500 μ m直径的光纤被证明将磨合时间从大约3-4小时减小到大约2小时。 For example, 500 μ m diameter fibers running time proved to be reduced from about 3-4 hours to about 2 hours instead of 250 μπι diameter fibers. 除了优化个体的传感器，在一个系统中的两个传感器的组合操作也可便于较快的启动。  In addition to optimizing the individual sensors, a combined operation of the two sensor system may also facilitate a faster startup. 将可预测的磨合特征合并到算法中，这帮助降低所感知的启动时间，从而也在这个时间期间减小手指针刺校准的数量。 The predictable running features incorporated into the algorithm, which helps to reduce perceived startup time, thereby reducing the number of calibration finger stick during this time also. 此外，如将在下面进一步讨论的，智能算法可通过可靠性指数方法补偿每个传感器元件的启动特征和任何传感器异常。 In addition, as will be further characterized starts discussed below, the smart algorithm may be compensated by the reliability index of each sensor element and the method of any sensor abnormality. 事实上，传感器的初始轮廓是早期传感器诊断算法的重要输入。  In fact, the initial contour sensor is an important early diagnosis algorithm input sensor. 初始化后的行为由系统评估以（1)确定传感器将准备好初始校准时的时间（自适应预热），以及（2)识别对葡萄糖波动不足够敏感的传感器（非关键故障检测）。 Behavior after initialization by the system to assess (1) the sensor is determined to prepare a good initial calibration time (adaptive warm-up), and (2) identifying fluctuations in glucose sensors are not sufficiently sensitive (non-critical fault detection). 在本发明的实施例中，先进算法组合来自每个传感器的可靠性信息，并利用正交冗余传感器的特征来减小滞后，提高启动时间并提高准确度。  In an embodiment of the present invention, a combination of advanced algorithms reliability information from each sensor, and using Orthogonal redundant sensors to reduce hysteresis, improve the start time and improve accuracy. 通过比较信号，故障可被确认且自校准可被执行，从而减少所需的葡萄糖仪表校准的数量。 By comparison signal, the fault can be confirmed and the self-calibration may be performed to reduce the amount of glucose meter calibration. 如图13A所示，算法考虑每个算法的信号和故障检测，并接着确定每个信号的可靠性并适当地对它们加权。  As shown in FIG. 13A, and a fault detection algorithm considers signals each algorithm, and then determines the reliability of each of the signals and weighting them appropriately. 算法还利用每个传感器的特定益处。 Using the algorithm also particular benefits of each sensor. 例如，与电化学传感器比较，光学传感器通常具有更稳定的信号，电化学传感器被已知具有随着时间的过去敏感度的逐渐变化，需要重新校准。 For example, compared with electrochemical sensors, optical sensors generally have a more stable signal with electrochemical sensors are known to have a gradual change in sensitivity over time, the need to recalibrate. 使用电化学阻抗频谱（EIS)测量或通过比较电化学传感器的信号的大的最近周期，可识别实例，其中电化学传感器的敏感度改变。 Electrochemical impedance spectroscopy (EIS) measurements or by a large recent periodic signal comparison electrochemical sensors may be identified instance, where the sensitivity change electrochemical sensor. 光学传感器然后允许对可能的敏感度变化的立即确认，且如果信号被认为足够稳定，则可基于光学传感器来重新校准电化学传感器。 The optical sensor is then allowed to change the sensitivity of possible immediate acknowledgment, and if the signal is considered sufficiently stable, the optical sensor can be recalibrated based electrochemical sensor. 这个自校准特征减少一般对维持高准确度所必需的外部校准的所需数量。 This self-calibration features to reduce the number of general external calibration to maintain high accuracy is required. 在最佳情况中，校准将需要维持信号中的置信度。 In the preferred case, the calibration of the confidence signal needs to be maintained. 虽然光学传感器通常更稳定，电化学传感器具有其它优点。  Although the optical sensors are generally more stable, electrochemical sensors have other advantages. 例如，在启动的前几个小时期间，电化学传感器被预期更快地达到半稳定点，但在接下来的几个小时内具有敏感度的稍微增加。 For example, during the first few hours of the start, an electrochemical sensor is expected to quickly reach a semi stable point, but with a slight increase in sensitivity over the next few hours. 如前所述，可将可预测的磨合特征合并在算法中。 As described above, the prediction can be combined in an algorithm running characteristics. 图13B示出实施例，其中诊断用于确定个体的信号的可靠性，所述信号接着被相应地加权。  FIG 13B illustrates an embodiment, wherein the individual signal for determining the reliability of diagnosis, the signal is then weighted accordingly. 个体的加权信号接着被相加并乘以校准因子以确定所计算的葡萄糖值。 Weighting the individual signals are then summed and multiplied by a calibration factor to determine whether the calculated glucose value. 如本文使用的术语"校准因子"或"计算因子"指血糖与传感器信号之比。 As used herein, the term "calibration factor" or "computing factor" means the ratio of glucose to the sensor signals. 在另一方面中，算法包括用于转换传感器信号以匹配血糖浓度的模型。  In another aspect, a method comprising converting a sensor signal to match the model of the blood glucose concentration. 见图14。 See Figure 14. 这通过双隔室模型来完成，双隔室模型假定传感器在与校准测量不同的隔室中。 This is accomplished by a two-compartment model, two-compartment model assumes that the sensor calibration measurements in different compartments. 该模型考虑了在校准测量发生所在的血液和传感器所位于的间质流体之间的葡萄糖的扩散。 The model considers the diffusion between the glucose in the blood and interstitial fluid calibration measurement where the sensor is located occurred. 该模型也考虑了由细胞摄取的葡萄糖。 The model also takes into account the cellular uptake of glucose. 预期光学传感器可具有比光化学传感器稍微更长的响应时间。  The optical sensor may be expected to have a somewhat longer than the photochemical response time of the sensor. 先进算法可通过检查每个信号的变化率并比较这两个信号来补偿这个滞后。 Advanced algorithms and compares the two signals can be used to compensate for this lag by checking the rate of change of each signal. 根据各种因素，电化学传感器可更快地检测变化。 Depending on various factors, the electrochemical sensor may detect changes quickly. 算法需要检测变化，且如果它不能补偿该变化，系统可对电化学传感器加权得更多。 Algorithm needs to detect the change, and if it can not compensate for this change, the system may have more weight to the electrochemical sensor. 因此，虽然当校准在更稳定的时期期间被进行时某些电流传感器可更好地运转， 双隔室模型的并入使能了在任何时候进行的校准的使用。 Thus, although when the calibration is performed during a certain period of more stable current sensor may be better functioning, incorporated two-compartment model using a calibrated enabled performed at any time. 如前所述和在图13A中示出的，根据本发明的实施例的传感器合并冗余和使用可靠性指标的传感器加权的益处。  As described above and shown in FIG. 13A, the combined sensor according to an embodiment of the present invention, the redundancy of the sensors and the reliability index weighted benefit. 在系统的示例性实施例中，多个电化学传感器被个体地评估，且为每个电化学传感器创建可靠性指标。 In an exemplary embodiment of the system, a plurality of individual electrochemical sensors are evaluated, and create reliability index for each of the electrochemical sensor. 在图15中，三个传感器发送数据。 In Figure 15, three sensors transmit data. 单独地，这些传感器中的每个将实现大约8%的准确度。 Separately, each of these sensors will achieve accuracy of about 8%. 然而当组合时，准确度提高到大约4. 4%。 However, when used in combination, to improve the accuracy to about 4.4%. 因此，通过利用其可靠性指标评估每个单独的传感器电流（图15A)并产生加权平均（图15B) 来提高传感器准确度。 Therefore, to improve the sensor accuracy through the use of indicators to assess the reliability of each individual current sensor (FIG. 15A) and generating a weighted average (FIG. 15B). 注意，创造性传感器、感测系统和这里的相关算法可适合于在家里和/或在医院环境中使用。 Note that creativity sensors, sensing systems and related algorithms may be adapted here at home and / or use in a hospital environment. 如所提到的，正交冗余系统包括使用"按需"协议实现校准频率的减小以将校准限制到2-4/星期（从例如每天2次校准降低）的几个特征。  As mentioned, the system includes the use of an orthogonal redundancy "on-demand" protocol calibration frequency is reduced to limit the calibration to 2-4 / week (for example, from twice daily to reduce calibration) features several . 这些特征包括：（1)电化学葡萄糖传感器的传感器准确度/持久性提高；（2)基于生理模型的校准算法；(3)在个体的部件达到稳定状态之后允许内部自校准的冗余和正交感测技术；以及（4)允许从基于定时校准请求到基于需要校准请求的转变的"智能"诊断。 These features include: a sensor (1) an electrochemical glucose sensor accuracy / improved persistence; (2) the calibration algorithm based physiological model; (3) allows the internal redundancy and self-calibration after n individual member reaches a steady state sympathetic measurement techniques; and (4) allows the "smart" diagnostic change request based on a request to be calibrated based on the timing alignment. 从历史角度看，CGM系统依赖于传感器校准的"最小规定采样时间"作为针对感测部件调节不准确特性的方式。  From a historical perspective, CGM sensor calibration system relies on the "minimum predetermined sampling time" as adjustment characteristic for inaccurate sensing member manner. 因此，现有的校准算法依赖于传感器操作的每12小时最低1 个校准点（ES9199、ES9573、ES9966)。 Thus, conventional calibration algorithms rely on the Low 1 every 12 hours operation of the sensor calibration point (ES9199, ES9573, ES9966). 基于这个标准，DexC〇m®SEVEN®PLUS产品例如在启动时和以后每12小时需要2次，且FieeStyle Navigator®耑要在插入后10、12、24 和72小时的校准。 Based on this criterion, DexC〇m®SEVEN®PLUS product startup and after every 12 hours, for example, need to 2 times, and to calibrate the FieeStyle Navigator® 耑 10, 12 and 72 hours after insertion. 因为感测技术提高了，采样要求降低了，但以系统准确度为代价。  Because sensing technology improves, reducing the sampling requirements, but at the expense of accuracy of the system. 相反，与现有传感器技术比较，创造性的正交冗余感测系统允许校准频率的明显减小，同时维持在其整个寿命中的传感器准确度的预期。 In contrast, compared with the prior art sensor, the inventive redundant orthogonal sensing system allows significant reduction in the frequency of calibration, its life while maintaining sensor accuracy is expected. 具有验证传感器性能的能力的诊断算法的实现允许从"适时"到"按需"校准协议的转变。  have the ability to implement a diagnostic algorithm to verify the performance of the sensor allows the transition from the "time" to "on-demand" calibration protocol. 在这个方面，图16(a)示出基于电流产生单传感器技术的模拟校准方案，而图16(b)示出通过本文公开的类型的测量冗余变得可能的替代形式。 In this regard, FIG. 16 (a) shows a current sensor technology based on the production of single analog calibration scheme, and FIG. 16 (b) shows the types of measurements by redundancy disclosed herein becomes possible alternatives. 按照后一校准方案，初始校准331仍然是必要的；然而，每日两次（时间安排的）校准请求不再是作为校准算法的部分所需要的。 After a calibration scheme in accordance with the initial calibration is still necessary 331; however, twice daily (scheduled time) alignment request is no longer a part of the calibration algorithm is required. 替代地，不频繁安排的请求333 (即，每72小时一次）和按需请求335的组合确保传感器校准只在系统识别出确认传感器健康状况的需要时是需要的。 Alternatively, the request infrequently arrangement 333 (i.e., every 72 hours) and a combination of on-demand request 335 ensures that the sensor calibration is only recognized when the sensor recognized the need for health is needed in the system. 因为使用这个方案的系统性能依赖于准确和频繁的诊断信息，故障检测和其它先进算法对在一致的基础上减少校准的数量是关键的。 Because this program uses the system performance depends on accurate and frequent diagnostic information, fault detection and other advanced algorithms for reducing the number of calibration on a consistent basis is critical. 注意，在发展中的当前原型电化学传感器具有13% MARD的内部目标，信号漂移小于10% /天。  Note that, in the current prototype development of electrochemical sensors has an internal target of 13% MARD, signal drift is less than 10% / day. 同样，基于在身体内的葡萄糖输送的双隔室流体流模型的校准算法将减小血液到皮下的浓度梯度效应（延迟）以及消除被认为是生理上不可能的来自信号的伪像。 Similarly, the calibration algorithm two-compartment model based on the fluid flow in the body will reduce the blood glucose delivered to the skin effect of the concentration gradient (delay) and the elimination of artifacts are considered physiologically impossible from the signal. 现在将讨论上面提到的传感器漂移和故障检测。  will now be discussed and fault detection sensor drift mentioned above. 在一个方面中，本发明的正交冗余系统通过提供内部参考增加了在漂移检测中的置信度，系统能够从该内部参考验证可疑的漂移并确认传感器偏差而不需要来自用户的行动。  In one aspect, the present invention is orthogonal to the redundant system by providing an internal reference increases the confidence in the detection of the drift, the system can verify the suspected drift of the reference and confirmation sensor deviation from the inside without requiring from the user action. 传感器漂移是所有感测系统的特性，并随着时间的过去或响应于其它环境条件例如温度、生物淤积等而出现。  Sensor drift characteristics of all the sensing system, and with the past or the response time such as temperature, etc. biofouling occurs in other environmental conditions. 在传感器设计（例如热稳定器、膜变化和电极治疗）中的这样的改进可被显示为将信号漂移减小到大约每天5-10%。 Design of the sensor (e.g., heat stabilizers, and changes in the membrane electrode treatment) such modification may be displayed as the signal drift is reduced to about 5-10% per day. 虽然相对小的漂移代表相对于现有传感器的改进，对校准频率和准确度的系统要求必须允许系统考虑这些偏差。 Although relatively small drifts with respect to the representative improving existing sensors, and system calibration frequency accuracy requirements of the system must be allowed to consider these deviations. 本文的创造性系统和有关的算法识别明显的传感器漂移（在两个传感器中）的情况，并考虑检测到的漂移或停止对用户的葡萄糖显示，直到潜在的故障例如通过校准被解决为止。  The inventive system and method described herein recognize distinct associated sensor drift (in the case of two sensors) and considering the detected drift of glucose or the user stops the display, until the potential failure is resolved, for example by calibration . 以这种方法，漂移检测通过信号分析来实现，并且是被馈送到系统可靠性指标（见图13A)的一个参数。 In this way, the drift detection is achieved by analyzing the signal, and is fed to the system a reliability index parameter (see FIG. 13A) of. 独立地，电化学和光学葡萄糖感测系统能够简单地通过评估周期性传感器行为和它如何在传感器寿命的过程中改变来完成传感器漂移的某个量的自我诊断。  Independently, electrochemical and optical glucose sensing system can easily be assessed through periodic behavior of the sensor and how it changes during the life of the sensor in order to finish a self-diagnosis of the sensor drift amount. 如前面所讨论的，光学传感器化学过程的非葡萄糖消耗性质提供对生物淤积不敏感的益处。 E.g., glucose consumption properties of the optical sensor of non-chemical processes previously discussed to provide a biofouling insensitive benefits. 因为葡萄糖敏感度不取决于穿越膜的扩散速率，通过生物淤积的传感器漂移通常不是关心的事。 Because glucose sensitivity does not depend on the rate of diffusion through the membrane, usually do not care about the drift of the sensor biofouling. 在故障检测中的当前技术稳定地朝着预测性诊断发展，预测性诊断被设计成在传感器问题影响葡萄糖读数之前主动识别它们。  In this technique fault detection diagnostic stably toward development, predictability predictive diagnostics are designed to identify active before they impact the glucose sensor readings problems. 本发明的正交冗余系统实现三层故障检测方法，即，只使用电化学电极、只使用光学传感器并接着使用来自组合信号的信息的故障检测。 An orthogonal system of the present invention is to achieve a redundant three fault detection method, i.e., using only an electrochemical electrode, an optical sensor and then using only the failure detection information from the combined signal. 使用电化学传感器，最复杂的故障检测使用电化学阻抗频谱（EIS)。  using an electrochemical sensor, the most complex fault detection using electrochemical impedance spectroscopy (EIS). EIS提供快速在线方法来诊断传感器和传感器膜状态。 EIS provides a method to diagnose fast line sensors and sensor film state. EIS的重要优点是，它可在传感器操作期间完成， 而不关闭传感器或改变电极状态。 EIS important advantage is that it can be accomplished during operation of the sensor, the sensor without closing or changing the state of the electrodes. 通过以固定的频率传递小AC电压信号连同传感器操作电压（Vset)来执行EIS。 Together with the sensor operating voltage (the Vset) EIS performed by passing a small AC voltage signal at a fixed frequency. 测量电流且计算阻抗。 And calculate an impedance measurement current. 这个测量在整个频率范围内重复，且接着检查阻抗输出以寻找与特定频率相关的膜特性。 This measurement is repeated over the entire frequency range, and then to check the output impedance looking film characteristics associated with a specific frequency. EIS可识别拙劣地运转的传感器和其中电极部分地从组织拉出（且因此不再正确地感测）的实例。  Sensor EIS may identify poorly operated and wherein the electrode is partially pulled out from the tissue (and therefore will not be detected correctly sense) examples. 这是特别有用的，因为患者在戴着微型部件时可能很难知道传感器拉出何时出现。 This is particularly useful, because the patient while wearing the micro sensor member may be difficult to know when to pull out occurs. 更重要地，EIS可用作预测性诊断工具，在传感器信号明显改变之前向系统警告问题。 More importantly, the EIS can be used as a predictive diagnostic tool, the system issues a warning before the sensor signal is significantly changed. 在图17A和17B所示的例子中，例如EIS检测低频尼奎斯特斜率的下降（图17A)， 该下降预测图17B所示的传感器信号中的漂移（传感器异常）。  In the example shown in FIGS. 17A and 17B, for example, low frequency drop detector EIS Nyquist slope (FIG. 17A), the sensor signal is lowered as shown in FIG. 17B prediction drift (sensor error). 在图17C中，使用EIS周期性地询问并分析电化学传感器，且将响应用于主动识别潜在的故障或失灵，使得在传感器导致不准确的葡萄糖测量之前传感器可被重新校准或关闭。 In FIG. 17C, using EIS and analyzed periodically queries electrochemical sensor, and the response to identify potential active for a malfunction or failure, causing the sensor so that the sensor can be recalibrated or closed before the glucose measurement inaccurate. 简而言之，这样的预测性诊断给系统提供通过搁置的数据或校准请求来减轻问题的机会，从而最小化对患者的影响。 Briefly, this predictive diagnostics provide opportunities to mitigate the problem by calibration request or data to the shelving system to minimize the impact on the patient. 用于检测信号异常的其它方法（不涉及EIS测量）包括其中所计算的葡萄糖不是正确的短周期、其中信号需要较强的滤波的周期或其中传感器的葡萄糖敏感度已改变的实例（在这种情况下，需要新校准）。  Other methods for detecting an abnormality signal (not involving EIS measurements) include those wherein the glucose is not correctly calculated short cycle, wherein the glucose sensitivity requires a strong signal filtering cycle or wherein the sensor has changed instances ( in this case, a new calibration). 对于光学传感器，如前面详述的，从试样信号和参考信号之间的比来计算葡萄糖值。  For the optical sensor, as detailed above, be calculated from the ratio between the sample signal and the reference signal glucose value. 独立地询问这两个信号并用于在使用期间检测故障。 These two independent interrogation signals and for detecting a failure during use. 参考和试样信号都必须在某个间隔（动态范围）内，且如果在这些间隔之外，传感器的性能将不是信任的。 The reference signal and the sample must be in a certain interval (dynamic range), and if out of these intervals, the sensor performance will not be trusted. 此外，如果参考或试样信号所呈现的变化率在给定限制之外，则这个行为将引起故障警报。 Further, if the rate of change of the reference signal or the samples presented in addition to a given limit, then this behavior will cause failure alarm. 例子是检测阅读器和传感器之间的未对准。 Examples of a misalignment between the sensor detector and the reader. 这将使两个信号在非常短的时间段内降低到非常低的值，并因此基于信号梯度控制功能引起警报。 This will reduce the two signals to a very low value in a very short period of time, and thus cause an alarm based on a signal gradient control function. 正交冗余系统允许信号的比较。 The comparison signal  Orthogonal redundant system allows. 基于每个传感器的信号特征，为每个信号创建可靠性指标。 Based on the signal characteristics of each sensor, creating reliability index for each signal. 比较每个传感器的可靠性指标和信号本身允许可疑故障的确认，或提供对两个信号是准确的算法的保证。 And comparing the reliability index of each sensor signal itself allows confirmation of suspected fault, or to provide two signals to ensure accurate algorithm. 对于当组合信号的可靠性在阈值之下的情况，手指针刺确认可能是必要的。 For the case when the reliability of the combined signal below the threshold, the finger may be necessary to confirm needling. 在其它区域中，系统可给出一定范围的值，例如用于药丸目的的预期最小葡萄糖值。 In other regions, the system can be given a range of values, for example, the minimum for the intended purpose pills glucose value. 微环境方面（例如药物或温度变化）有影响系统的可能性，但光学传感器不一定以与电化学传感器相同的方式做作出响应。 The micro-environment influence the possibility of the system (e.g., a drug or a change in temperature), but not necessarily to the optical sensor and an electrochemical sensor responds the same way to do. 例如，电活性物质可能引起在电化学传感器中的增加的电流，但光学传感器不以相同的方式被影响或可能由于此而不受影响。 For example, electroactive species may lead to an increased current in an electrochemical sensor, but the optical sensor is not affected in the same way or may be affected due to this. 在本发明的系统中的故障检测是相当鲁棒的，因为多传感器系统具有能够确认故障的增加的益处。  In the failure detection system of the present invention is very robust, because the system has the benefit of multi-sensor can confirm the increase of the fault. 正交冗余传感器增加这个益处，因为光学传感器和电化学传感器具有不同的故障模式和对干扰化合物的不同响应。 Orthogonal redundant sensor increases the benefit, as optical sensors and electrochemical sensors have different responses to different failure modes of interfering compounds. 正交冗余传感器系统通过冗余、故障检测和先进算法的使用来增加佩戴的持续时间和数据的可靠性以确保至少一个传感器提供可靠的测量。  Orthogonal redundant sensor system through the use of redundant, fault detection and advanced algorithms to increase reliability of the data and the duration of wear of the at least one sensor to ensure reliable measurements. 此外，传感器寿命被限制到佩戴的指定持续时间以确保数据的可靠性。 Further, the sensor life is limited to a specified duration of wear to ensure the reliability of data. 佩戴的持续时间可被分类为两种方式：（1)传感器的总寿命；以及（2)在传感器正显示准确的数据的佩戴期间的时间的百分比。 Duration  may be classified as worn in two ways: total lifetime (1) of the sensor; and (2) the percentage of time the sensor being displayed during wear accurate data. 通过敏感度的损失和可由环境影响引起的体内漂移而限制传感器寿命。 Vivo sensitivity loss and environmental impact caused by drift limit sensor life. 正交冗余传感器系统通过冗余和双感测技术的使用来降低较早传感器终止的频率，确保至少一个传感器在增加的持续时间提供可靠测量并保护免受环境影响。 Orthogonal redundant sensor system to reduce the frequency of early termination by using redundant sensors and dual sensing technology, to ensure that at least one sensor provides a reliable measure of the increase in the duration and protects against environmental influences. 此外，身体佩戴的设备必须被保护免受传感器拉出，传感器拉出导致较早终止。 In addition, the body worn device must be protected from the sensor is pulled out, pull out the sensor lead to early termination. 因此， 可对组合设备实施用于补丁和overtape的定制粘合剂。 Accordingly, embodiments may be customized for adhesive patches and overtape combination of devices. 如前所述（见上面的关于"准确度"的章节），故障检测算法限制患者可见的不准确的数据，但作为结果可将数据限制到连续感测益处不被实现的程度。  As described above (see the section above on the "accuracy"), the failure detection algorithm limits patients that inaccurate data, but the data can be limited as a result of sensing the degree of benefit to the continuous sensing is not achieved. 利用冗余感测系统提高了传感器显示数据的时间百分比，因为在两个传感器中的同时异常的频率明显小于在单个传感器中的。 Redundancy sensing system to improve the percentage of time the sensor data display, at the same time because the abnormal frequencies of the two sensors is significantly less than in a single sensor. 此外，传感器还可能保持被植入超过七天。  In addition, the sensor holder may also be implanted over seven days. 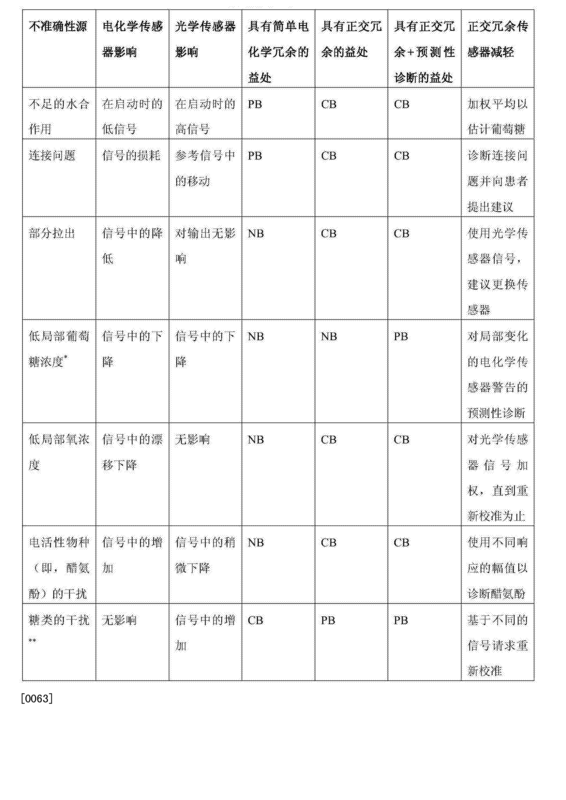 被植入超过所标记的使用期限的传感器可能更可能提供错误的数据。 Tag is implanted over the period of use of the sensor may be more likely to provide erroneous data. 因此，为了确保可靠性，系统将传感器使用期限限制到所标记的时间段很重要。 Thus, to ensure reliability, the system will be limited to the lifetime of the sensor mark period is very important. 这通过利用在以可检测传感器是否以前被使用的诊断方法耦合的仪器中的嵌入式固件定时器的系统设计来实现。 This is achieved by using the design of embedded firmware timer of the instrument to detect whether the sensor diagnostic method previously used in the coupling system. 通过组合嵌入式定时器和智能诊断，系统确保传感器超过最佳可靠性和准确度的时期时不被使用。 By combining the embedded timer and intelligent diagnostics system ensures that the sensor is not used more than optimum reliability and accuracy of the period. 虽然将两个传感器系统组合成单个设备需要更大的仪器和电池容量，微型化和集成方法可用于确保发射机设备10在尺寸上类似于其它CGM设备。  Although two sensor systems are combined into a single device requires more equipment and battery capacity, miniaturization and integration methods can be used to ensure that the transmitter device 10 is similar in size to other CGM devices. 设备尺寸、形状因子和使用模型在疗法采用中起重要作用。  device size, shape factor and using the model employed in the therapy plays an important role. 当将设备放置在身体上时，较大的、简单形状的设备往往更容易处理，而较小的、有机构造的形状的设备往往对佩戴是更优选的。 When the device is placed on the body, a large, simple shape is often easier to process equipment, while the smaller, the shape of the device configuration of the organic tend to wear are more preferred. 在本发明的优选实施例中，采用基于前述因子的良好平衡的设计。 In a preferred embodiment of the present invention, using a well-balanced design based on the aforementioned factors. 为了在设备被佩戴在衣服之下时避免不雅观的变形，患者通常偏爱在增加的高度之上的较大设备覆盖区。  In order to avoid unsightly deformation when the device is worn under clothing, patients often prefer larger devices increase in coverage area over the height. 因为根据本发明的实施例的设备包含比当前可用的其它CGMS产品更复杂和牢固的内部部件，应理解，组件的覆盖区稍微大于当前可用的覆盖区。 Since CGMS comprise other than the current products available in a more complex and secure the internal components of an embodiment of the apparatus according to the present invention, it should be appreciated that assembly is slightly larger than the coverage area of ​​the currently available coverage area. 因此，设备尽可能薄和光滑，在容积效率方面有最小牺牲。 Thus, the device as thin and smooth, with minimal sacrifice in terms of volumetric efficiency. 以新颖的方式将晶片级设计和制造方法用于最小化光电子（或光学）询问系统的尺寸。  In a novel manner the wafer-level design and manufacturing methods for minimizing an optoelectronic (or optical) interrogation size of the system. 可通过将一个多功能过滤层固定在光学部件的两个注射成型层之间来产生堆叠式平面集成光学系统（SPIOS)。 It can be prepared by a multifunctional filter fixed between two injection molded components to produce a layer of the optical stacked planar integrated optical systems (SPIOS) layer. SPIOS形成自承的实心块。 SPIOS solid block formed self-supporting. SPIOS在图18的右手侧示出，左手侧显示从分立部件构造的光学系统的例子。 SPIOS shown in the right hand side of FIG. 18, from the left-hand side shows an example of configuration of the optical system of discrete components. 更具体地，在图19所示的本发明的实施例中，创造性的光学询问系统可设计成被制造为SPIOS (也被称为"晶片规模光学系统"或"晶片级光学系统"）。  More specifically, in the embodiment of the present invention shown in FIG. 19, the inventive optical interrogation system may be designed to be manufactured as SPIOS (also called "wafer-scale optical system" or "wafer-level optical system" ). 如图19所示，SPIOS 包括堆叠和对齐的各种层。 As shown in FIG. 19, SPIOS include various layers stacked and aligned. 在晶片层1610中，一个或多个光源（例如LED和光电二极管） 和检测器可布置在晶片上。 In the wafer layer 1610, one or more light sources (e.g. LED and photodiode) and the detector may be arranged on the wafer. 替代地，它们可以是裸露的芯片（例如由Avago Technologies 或Hamamatsu公司出售的），其可单独地被对齐并层压到SPIOS单元上。 Alternatively, they may be bare chip (e.g. Hamamatsu or sold by Avago Technologies Corporation), which can be individually aligned and laminated to SPIOS unit. 一个或多个光学层1620可包括反射镜、吸收器和/或布置在晶片尺寸的注塑成型圆盘上的其它光学部件。  One or more layers of the optical member 1620 may include other optical reflector, an absorber, and / or injection molding a disc disposed on the wafer size. 限定光学表面的模具插件由金刚石车削/铣削公司（例如在丹麦的Kaleido Technology)制造。 Mold insert defining an optical surface (e.g., Denmark Kaleido Technology) manufactured by diamond turning / milling company. 金或被保护的银例如通过派射被涂敷到镜表面，同时在该过程期间掩蔽任何吸收器。 Gold or silver protection is applied to the mirror surface, for example, send by radio, while the mask any absorber during the process. 光学过滤层1630包括具有可选的（例如介电）涂层的晶片尺寸的玻璃衬底。  The optical filter layer 1630 comprises a glass substrate wafer having an optional size (e.g., a dielectric) coating. 具体地，可使用离子辅助溅射将多层光学涂层涂敷到玻璃衬底的两侧上以形成耐久的涂层。 Specifically, the use of ion assisted sputtering multilayer optical coatings applied to both sides of a glass substrate to form a durable coating. 该技术类似于在通过例如美国的Semrock和丹麦的Delta制造焚光过滤器中使用的技术。 This technique is similar to the technique used by the U.S. and Delta Semrock burning producing optical filters, for example, in Denmark. 因此，在一个例子中，涂敷在衬底的两侧上的介电涂层用来过滤激发光以及因而产生的荧光。 Thus, in one example, a dielectric coating is applied on both sides of the substrate used to filter the excitation light and the fluorescence thus generated. 如图19所示，在一个实施例中，晶片层1610可跟随有光学层1620、光学过滤层1630和另一光学层1620。  As shown in FIG 19, in one embodiment, the wafer layer 1610 may be followed by 1620 optical layers, the optical filter layer 1630, and another optical layer 1620. 整个叠层然后例如通过胶合完全被对齐和层压，且将连接结合到芯片上。 Then the entire stack, for example, completely aligned and laminated by gluing, and the connector is coupled to the chip. 接着使用例如金刚石锯将叠层切成块1640以形成多个组装的SPIOS单元1670,其可接着被安装和连接到电子设备。 Then, for example, using a diamond saw cut into the laminate to form blocks 1640 over 1670 SPIOS assembled unit, which can then be installed and connected to the electronic device. 上述系统可被制造得较小，并适合于大规模生产。  The system can be made small, and suitable for mass production. 系统可用于询问在光散射环境中的传感器，例如植入到皮肤中的传感器以及光纤传感器。 The system can be used to interrogate the sensor light scattering environment, e.g. implanted into the skin sensors and fiber optic sensors. 封装可用于挡住环境光。 Package can be used to block the ambient light. 而且，如图20所示，为了节省板空间，可将LED驱动器、两个放大器链和专用于光学传感器的温度传感器集成到定制芯片中，并添加到电化学传感器的模拟前端（AFE)，例如设计成与MiniLirik®发射机（从Medtronic公司可得到的MiniLink® ) -起使用的AFE。 Further, as shown, in order to save board space, can be LED driver amplifier chain and two optical sensors dedicated to the temperature sensor 20 into a custom integrated chip, and added to the analog front end of the electrochemical sensor (the AFE), e.g. a transmitter designed to MiniLirik® (available from Medtronic, Inc. MiniLink®) - AFE from use. 在本发明的实施例中，图5所示的LED光源1320可以由用于照亮试样化学物质的红色激光二极管代替。  In an embodiment of the present invention, the LED light source 1320 shown in FIG. 5 may be used to illuminate a sample by a chemical substance instead of red laser diodes. 激光二极管（与LED比较，更小的源直径发射角）的性质提供与光纤传感器的激发有关的光学系统的尺寸的减小以及从激光二极管到光纤传感器的增强的耦合效率。 Properties of the laser diode (compared with the LED, the smaller the diameter of the source emission angle) is associated with reduced excitation provides an optical fiber sensor and the size of the optical system from the laser diode to enhance the coupling efficiency of the optical fiber sensor. 光纤传感器转而导致较高的信噪比，较高的信噪比又再次导致较短的测量时间和较小的电池尺寸。 An optical fiber sensor in turn results in a higher signal to noise ratio, resulting in higher SNR and shorter measurement time and a smaller battery size again. 电池容量可减小多达75%，这也明显减小发射机10的尺寸。 Battery capacity may be reduced up to 75%, which significantly reduce the size of the transmitter 10. 而且，激光二极管的较高的激发效率和较窄的波长范围减小杂散光问题，使得较低的光拾取可在检测器侧处被接受。  Moreover, a high excitation efficiency and a narrower wavelength range of the laser diode to reduce the stray light problem, the optical pickup such that the lower side may be accepted at the detector. 作为结果，与荧光检测有关的光学系统的部分减小了。 As a result, part of the fluorescence associated with the detection optical system is reduced. 总的来说，激光二极管的使用可将光学系统的尺寸减小到使用LED激发的光学系统的尺寸的大约75%。 In general, a laser diode may be reduced to the size of the optical system is about 75% of the size of the optical system using an LED excitation. 因此，例如使用激光二极管作为其光学询问系统的照明源的发射机设备10可具有大约15cm 3的体积和大约IOg的重量。 Thus, for example, a laser diode source as an illumination optical system interrogation transmitter device 10 may have a volume of about 15cm 3 by weight and about the IOg. 为了使用红色激光二极管，（试样）化学物质必须被红色偏移的，意味着必须使用在较高波长处工作的新荧光团，以便在激光二极管能够激发化学物质的范围内操作。  In order to use the red laser diode (sample) chemicals must be red shifted, means must be used at a higher wavelength fluorophores new work, to be able to excite the range of chemical operation in the laser diode. 在这个方面，已发现，几个荧光团--包括AF647、QSY21和AF750--可结合645nm激光二极管源来使用。 In this respect, it has been found, several fluorophores - including AF647, QSY21 and AF750-- 645nm laser diode source may be combined for use. 见图21。 See Figure 21. 为了进一步小型化光学系统并因此减小发射机10的尺寸，将激光二极管合并到上面讨论的堆叠平面集成光学系统（SPIOS)格式中是有益的。  In order to further miniaturization of the optical system and thus reduce the size of the transmitter 10, the laser diode is incorporated into the plane of the stack of integrated optical systems discussed above (SPIOS) format is beneficial. 已发现，这样的实现将发射机尺寸进一步减小到大约11cm 3。 It has been found, such an implementation of the transmitter to further reduce the size of approximately 11cm 3. 一般电化学传感器例如Enlite®传感器可通常在室温和环境大气相对湿度水平下被存储。  Usually Enlite® sensor may e.g. electrochemical sensor typically stored at room temperature and ambient air relative humidity levels. 为了能够在这些相同的条件下存储正交冗余传感器（其可包括这样的电化学传感器）并同时维持期望的可用性，本发明的实施例包括光学传感器的干式版本。 In order to store orthogonal redundant sensors under these same conditions (which may include a electrochemical sensor) while maintaining the desired availability, embodiments of the present invention comprises a dry version of the optical sensor. 如在这个上下文中使用的术语"干化学性质"指与原始湿成分比较的试样的干形式。 The term used in this context, "dry chemical properties" refers to a form of the original dry sample wet components comparison. 干化学物质可以例如以结冰干燥粉末的形式或悬浮在聚合物中，且不仅使能干燥封装和干燥存储，而且提高贮存期稳定性。 Dry chemicals can e.g. freeze dry powder or suspended in the polymer, and drying to enable encapsulation and only dry storage, to improve the shelf life and stability. 可例如经由冰冻干燥步骤来干燥试样化学物质，冰冻干燥步骤包括使试样冻结以及通过快速真空干燥使液体介质升华。 For example by freeze drying step of drying the sample chemical species, comprising the step of freeze drying the sample by flash freezing and vacuum drying of the liquid medium sublimation. 而且，如前所述，一般电化学传感器通常通过（电子束）辐射灭菌过程来灭菌。  Further, as described above, the electrochemical sensor typically generally sterilized by radiation sterilization process (electron beam). 然而，相同的灭菌过程应用于光学传感器或包括光学传感器的正交冗余传感器提出实际挑战，因为电子束辐射可能不利地影响试样化学物质，且因此导致（光学）传感器响应的损失。 However, the same sterilization process is applied to an optical sensor or an optical sensor includes an orthogonal redundant sensors presented practical challenges, because the electron beam radiation may adversely affect the chemical substance sample, and thus result in a loss (optical) sensor response. 在这个方面，在本发明的实施例中，在试样中包括保护性配剂可以对抗电子束对例如MBL和荧光染料的有害影响。 In this regard, in the embodiment of the present invention, in a sample may include a protective agent against harmful impact with the electron beam, for example, MBL and fluorescent dye. 保护性配剂包括保护性化学制剂，保护性化学制剂除了经受辐射灭菌影响以外还便于传感器水合作用和启动。 The protective formulations comprising protective chemicals, chemical protection in addition to radiation sterilization impact sensor further facilitate hydration and startup. 关于上述干燥化学物质和保护性配剂，还发现，即时没有保护性配剂，使用上述干燥化学物质的光学传感器在暴露于电子束辐射时也显示在传感器响应方面的很小变化。  drying of the above chemicals and protection formulation, also found that there is no immediate protection formulation, using the optical sensor drying chemicals also show little change in terms of the response of the sensor when exposed to electron beam radiation. 此外，在光纤传感器中的干燥化学物质被显示在5°C下在干燥状态中保持其稳定性三个月。 Further, the optical fiber sensor in the dry chemical is displayed for three months to maintain its stability in the dry state at 5 ° C.
 连接性和数据入库通过与例如从Medtronic公司可得到的联网产品一一包括手持监测器（例如MySentry™葡萄糖监测器）和CareLink®治疗管理软件一一通信而与正交冗余传感器系统集成。  connectivity and data storage by, for example, available from Medtronic, Inc. networking products-including a handheld monitor (e.g. MySentry ™ glucose monitor) and eleven CareLink® therapy management software of redundant communications orthogonal sensor system integration. 在一个实施例中，Medtronic系统提供在Medtronic患者网络（MPN)和基于互联网的Medtronic CareLink®治疗管理软件系统之间的数据传输容量。  In one embodiment, the system provides a Medtronic Medtronic patients network (MPN) and Internet-based data transmission capacity between the Medtronic CareLink® therapy management software system. 该系统被设计成有效地提供数据下载、入库，并用于患者及其健康护理提供者（HCP)的报告。 The system is designed to efficiently provide data download, storage, and reporting for patients and their health care provider (HCP) is. 患者和HCP以很多方式一一包括审查数据、理解行为和优化治疗一一使用CareLink®报告。 Patient and HCP in many ways - including review of the data, understand the behavior and optimize the use of therapeutic eleven CareLink® report. 额外的报告在CareLink®系统（HCP可得到）的"专业"版本中提供决策支持，该careLink®系统使在临床环境中的数据分析合理化并强调可推动改善的结果的治疗修改的机会。 Additional reports provide decision support system in CareLink® (HCP available) "professional" version, the careLink® system enables data analysis in the clinical environment and stressed the opportunities for rationalization of modification therapy can promote the improved results. 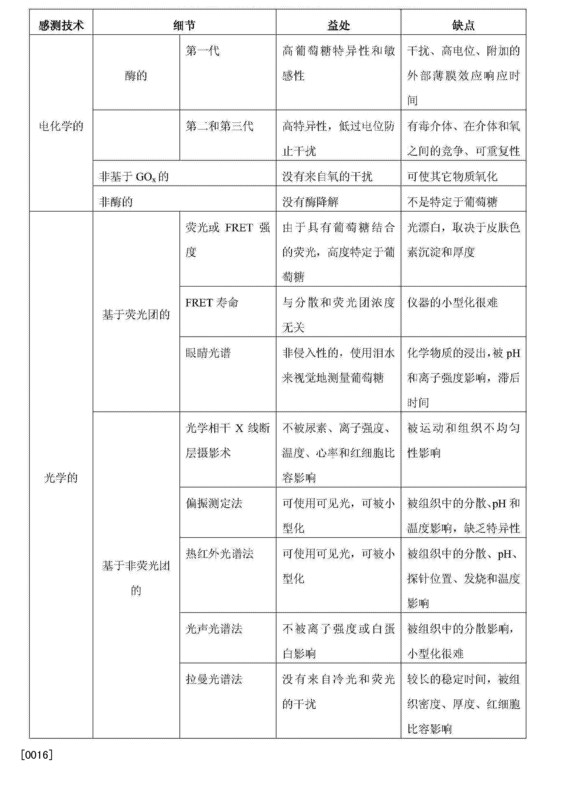 OBC的主要功能是提供移动非固定MPN连接性和数据处理。  The main function is to provide a mobile OBC MPN non-fixed connection and data processing. 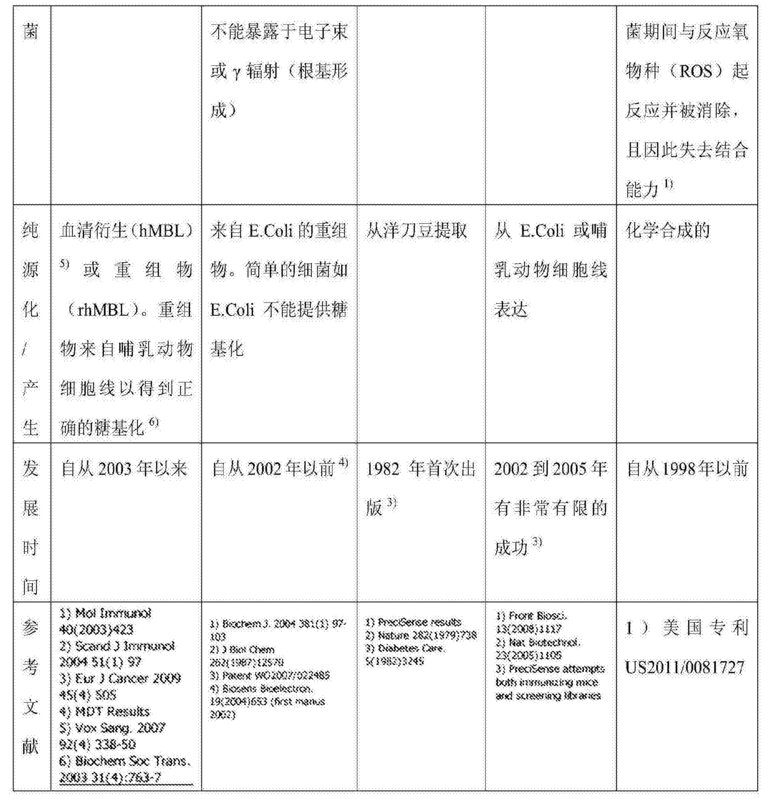 OBC与Medtronic专用RF协议通信以建立与MPN的通信并通过蜂窝网络容量将它们传送到"云"。 Medtronic OBC and dedicated RF communication protocol to establish communication with a cellular network MPN capacity and transmits them to the "cloud." 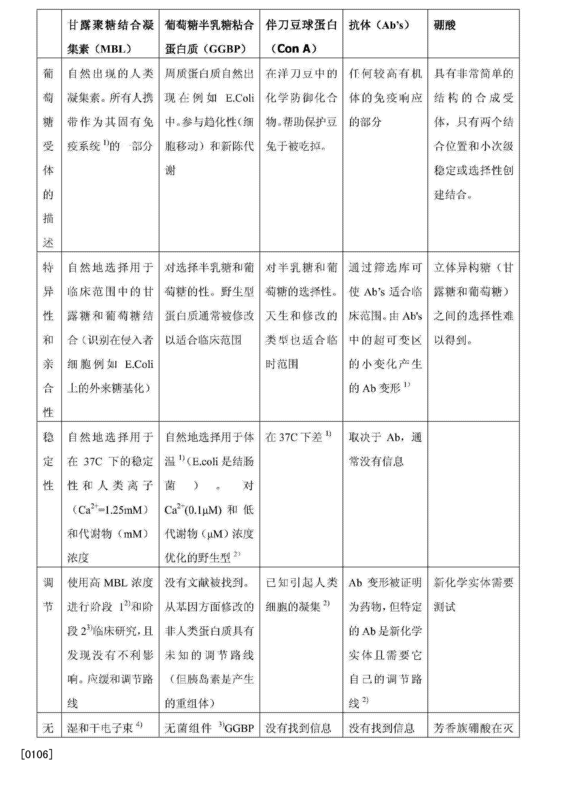 数据可接着从云取回并发送到CamLink®个人的基于互联网的系统。 Data may then be retrieved and sent to an Internet-based system from CamLink® personal cloud. 当蜂窝信号是不可得到的时，OBC 继续维持收集和处理来自MPN的数据所需的操作，直到蜂窝信号被重新建立为止。 When the cellular signal is not obtained, the continuation of an OBC required to collect and process data from the MPN operation until the cellular signal is re-established. 一旦云中的数据是近实时地可得到的，CareLink®系统就可传送针对市场上可买到的启用web的电子设备（例如智能电话和平板计算机）设计的特征。 Once the data in the cloud is available in near real time, CareLink® for the transmission system can be a commercially available web-enabled electronic device (e.g., a smart phone and a tablet computer) the design features. 如前所述，关于图1和11，在优选实施例中，OBC可以以具有用于校准的集成血糖仪的手持控制器或监测器的形式。  As described above, with respect to FIGS. 1 and 11, in a preferred embodiment, an OBC handheld controller may be used to calibrate or monitor having an integrated blood glucose meter in the form of embodiment. 手持监测器被设计成结合正交冗余传感器系统来工作。 Handheld monitor is designed to bind to an orthogonal redundant sensor systems work. 除了将数据发送到云以外，手持监测器还通过使用提供误差校验的算法来提高准确度，确保不准确的血糖读数不被传递。 In addition to transmitting data to the cloud outside, the handheld monitor also provides an error checking algorithm to improve the accuracy by using, to ensure accurate blood glucose reading is not being transmitted. 虽然上面的描述指本发明的特定实施例，将理解，可进行很多修改，而不偏离其精神。  Although the description above refers to particular embodiments of the present invention will be understood that many modifications may be made without departing from the spirit thereof. 附随的权利要求预期涵盖如将落在本发明的真实范围和精神内的这样的修改。 It is intended to encompass, as will fall within the true scope and spirit of the invention such modifications appended claims. 当前公开的实施例因此在所有方面被考虑为例证性的而不是限制性的，由所附权利要求指示的本发明的范围以及出现在权利要求的等效形式的意义和范围内的所有变化因此被认为包括在其中。  The presently disclosed embodiments are therefore to be considered as illustrative and inner and not restrictive, the scope of the present invention is indicated by the appended claims and equivalents appear in the meaning and range of the claims in all respects Therefore, all changes to be included therein. 1. 一种连续葡萄糖监测系统，包括： 正交冗余葡萄糖传感器，其包括： 光学葡萄糖传感器，其具有布置在用户的身体外部的近侧部分和内置在所述用户的身体中的远侧部分，其中所述光学葡萄糖传感器包括具有葡萄糖受体、葡萄糖类似物和第一荧光团的试样；以及非光学葡萄糖传感器，其具有布置在所述用户的身体外部的近侧部分和内置在所述用户的身体中的远侧部分； 手持监测器，其具有显示器；以及外部发射机，其具有容纳所述光学葡萄糖传感器的所述近侧部分和所述非光学葡萄糖传感器的所述近侧部分的壳体，其中所述发射机包括位于所述壳体中的仪器以接收来自所述光学传感器的光学信号和来自所述非光学传感器的非光学信号并且将所述光学信号和所述非光学信号中的每一个转换成相应的葡萄糖值，并且其中所述发射机以无线方式发送 A continuous glucose monitoring system, comprising: an orthogonal redundancy glucose sensor, comprising: an optical glucose sensor having disposed outside the body of the user and a proximal portion built in the distal portion of the user's body wherein said optical sensor comprises a glucose receptor having a glucose, glucose analogue sample and a first fluorophore; glucose and a non-optical sensor, having a proximal portion and disposed external to the built-in the user's body the distal portion of the body of the user; hand-held monitor, having a display; and an external transmitter, said proximal portion having a proximal portion receiving the optical glucose sensor and the non-optical sensor glucose housing, wherein the transmitter comprises a device positioned in the housing to receive sensor signals from the optical and non-optical optical signal from the non-optical sensor and the non-optical signal and said optical signal each of corresponding conversion into glucose value, and wherein said transmitter wirelessly transmits 述相应的葡萄糖值。 Said respective glucose value. 2. 如权利要求1所述的系统，其中所述非光学葡萄糖传感器是电化学葡萄糖传感器。 2. The system according to claim 1, wherein said non-optical glucose sensor is an electrochemical glucose sensor. 3. 如权利要求2所述的系统，其中所述电化学葡萄糖传感器包括多个电极。 The system according to claim 2, wherein said plurality of electrodes includes the electrochemical glucose sensor. 4. 如权利要求3所述的系统，其中所述多个电极中的每一个包括布置在所述用户的身体外部的所述近侧部分和内置在所述用户的身体中的所述远侧部分。 4. The system according to claim 3, wherein each of said plurality of electrodes includes the disposed outside the body of the user and embedded in the proximal portion of the user's body distal section. 5. 如权利要求4所述的系统，其中所述多个电极中的每一个的所述远侧部分被皮下地插入到所述用户的身体内。 5. The system as claimed in claim 4, wherein each of said distal portion wherein said plurality of electrodes are subcutaneously inserted into the body of the user. 6. 如权利要求4所述的系统，其中所述多个电极沿着所述电化学葡萄糖传感器的长度进行分布。 The system as claimed in claim 4, wherein said plurality of electrodes are distributed along the length of the electrochemical glucose sensor. 7. 如权利要求6所述的系统，其中所述多个电极是工作电极。 7. The system according to claim 6, wherein said plurality of electrodes are working electrodes. 8. 如权利要求1所述的系统，其中所述光学葡萄糖传感器包括光纤，所述光纤具有布置在所述用户的身体外部的所述近侧部分和内置在所述用户的身体中的所述远侧部分。 8. The system according to claim 1, wherein said glucose sensor comprising an optical fiber, said fiber having disposed on the outside of the body of the user and embedded in the proximal portion of the user's body distal portion. 9. 如权利要求8所述的系统，还包括可渗透葡萄糖的膜，其中所述膜具有闭合端、中空内部和耦合到所述光纤的远侧部分的开口端。 9. The system of claim 8 hollow interior and an open end coupled to the distal portion of the optical fiber as claimed in claim, further comprising a glucose-permeable membrane, wherein the membrane has a closed end. 10. 如权利要求9所述的系统，其中所述试样容纳在被限定在所述膜的中空内部中和在所述光纤的远侧部分与所述膜的闭合端之间的试样隔室。 10. The system according to claim 9, wherein the sample received in the sample compartment is defined within the hollow interior of the membrane between the closed end and the distal portion of the membrane of the optical fiber room. 11. 如权利要求10所述的系统，其中所述试样隔室被放置在所述用户的组织内。 11. The system according to claim 10, wherein the sample compartment is placed in the user organization. 12. 如权利要求9所述的系统，其中所述膜是生物可降解的。 12. The system according to claim 9, wherein the membrane is biodegradable. 13. 如权利要求8所述的系统，其中所述光纤的所述近侧部分光学地耦合到试样询问系统。 13. The system according to claim 8, wherein said portion of said optical fiber is optically coupled to the proximal sample interrogation system. 14. 如权利要求13所述的系统，其中所述试样询问系统是光电询问系统。 14. The system according to claim 13, wherein the sample is a photoelectric interrogation system interrogation system. 15. 如权利要求14所述的系统，其中所述询问系统包括照明源，且其中所述照明源是红色激光二极管。 15. The system according to claim 14, wherein the interrogation system comprises an illumination source, and wherein said illumination source is a red laser diode. 16. 如权利要求15所述的系统，其中所述第一荧光团是Alexa Fluor647(AF647)、 Alexa Fluor750(AF750)和QSY 21 中的一个。 16. The system according to claim 15, wherein said first fluorophore is Alexa Fluor647 (AF647), a Alexa Fluor750 (AF750) and QSY 21 in. 17. 如权利要求14所述的系统，其中所述询问系统是堆叠平面集成光学系统（SPIOS)。 17. The system according to claim 14, wherein the interrogation system is a stack of planar integrated optical systems (SPIOS). 18. 如权利要求13所述的系统，其中所述询问系统容纳在所述发射机的内部。 18. The system according to claim 13, wherein the interrogation system is housed inside the transmitter. 19. 如权利要求8所述的系统，其中所述光纤具有圆形横截面，所述圆形横截面具有在200 μπι与500 μπι之间的直径。 19. The system according to claim 8, wherein said optical fiber has a circular cross-section, having a circular cross-section with a diameter between 200 μπι to 500 μπι. 20. 如权利要求8所述的系统，其中所述光纤具有圆形横截面，所述圆形横截面具有小于200 μ m的直径。 20. The system according to claim 8, wherein said optical fiber has a circular cross-section, the circular cross-section having a diameter of less than 200 μ m.
21. 如权利要求1所述的系统，其中所述试样还包括不同于所述第一荧光团的参考荧光团。 21. The system according to claim 1, wherein said sample further comprises a fluorophore different from the first reference fluorophore. 22. 如权利要求21所述的系统，其中所述参考荧光团是Alexa Fluor700 (AF700)。 22. The system according to claim 21, wherein the reference fluorophore is Alexa Fluor700 (AF700). 23. 如权利要求21所述的系统，其中所述参考荧光团是被标记到人类血清白蛋白(HSA)上。 23. The system according to claim 21, wherein said fluorophore is reference to labeled human serum albumin (HSA). 24. 如权利要求1所述的系统，其中，利用所述第一荧光团来标记所述葡萄糖受体，利用染料来标记所述葡萄糖类似物，并且所述第一荧光团和所述染料形成F0I51PX共振能量传输对。 24. The system according to claim 1, wherein the first fluorophore using a glucose receptor labeled by the dye-labeled glucose analogue, and wherein the first fluorophore and said dye-forming F0I51PX resonance energy transfer pair. 25. 如权利要求24所述的系统，其中所述葡萄糖受体是甘露聚糖结合凝集素（M BL)， 并且所述葡萄糖类似物是葡聚糖。 25. The system according to claim 24, wherein the glucose receptor is mannan-binding lectin (M BL), and the glucose analog is dextran. 26. 如权利要求25所述的系统，其中所述第一荧光团是Alexa Fluor594 (AF594)，并且所述染料是六甲氧基晶紫-1(HM CV1)。 26. The system according to claim 25, wherein said first fluorophore is Alexa Fluor594 (AF594), and said dye is crystal violet hexamethoxy -1 (HM CV1). 27. 如权利要求24所述的系统，其中所述第一荧光团和所述染料中的每一个均是水溶性的。 27. The system according to claim 24, wherein each of said first group and said fluorescent dyes are water-soluble. 28. 如权利要求1所述的系统，其中所述光学传感器和所述非光学传感器的相应的远侧部分被协同定位在所述用户的身体内。 28. The system according to claim 1, wherein the respective distal portion of the non-optical sensor and the optical sensor are co-located within the body of the user. 29. 如权利要求1所述的系统，其中所述外部发射机被佩戴在所述用户的身体上。 29. The system according to claim 1, wherein said external transmitter worn on the user's body. 30. 如权利要求29所述的系统，其中所述外部发射机被依尺寸制造，以便具有不大于15cm3的体积和大约10g的重量。 30. The system according to claim 29, wherein said outer sized transmitter is manufactured so as to have a volume and a weight of no greater than about 15cm3 10g. 31. 如权利要求30所述的系统，其中所述外部发射机的体积为大约11cm3。 31. The system according to claim 30, wherein the volume of the external transmitter is approximately 11cm3. 32. 如权利要求1所述的系统，其中所述非光学葡萄糖传感器包括多个电极，每个所述电极具有布置在所述用户的身体外部的近侧部分和内置在所述用户的身体中的远侧部分， 并且其中所述光学葡萄糖传感器包括光纤，所述光纤具有布置在所述用户的身体外部的近侧部分和内置在所述用户的身体中的远侧部分。 32. The system according to claim 1, wherein said non-optical glucose sensor comprising a plurality of electrodes, each electrode having a proximal portion and disposed outside the built-in body of the user in the user's body a distal portion, and wherein said optical glucose sensor comprising an optical fiber having an outer body disposed in the proximal portion of the user and built in a distal portion of the user's body. 33. 如权利要求32所述的系统，其中所述多个电极的相应的远侧部分和所述光纤的所述远侧部分被协同定位在所述用户的身体内。 33. The system according to claim 32, wherein the distal portion of the distal portion of the respective electrodes and said plurality of fibers are co-located within the body of the user. 34. 如权利要求1所述的系统，其中所述光学葡萄糖传感器具有至少一种故障模式，所述非光学葡萄糖传感器具有至少一种故障模式，并且所述光学葡萄糖传感器的所述至少一种故障模式不同于所述非光学葡萄糖传感器的所述至少一种故障模式。 34. The system of claim 1 and wherein said at least one optical glucose sensor fault claim, wherein said optical glucose sensor having at least one failure mode, the non-optical glucose sensor having at least one failure mode, the non-optical mode different from the glucose sensor at least one failure mode. 36. 如权利要求35所述的系统，其中所述系统还具有至少95%的敏感度和特异性以及低于10%的假警报发生率。 36. The system according to claim 35, wherein said system further having at least 95% sensitivity and specificity, and false alarm rate of less than 10%. 37. 如权利要求1所述的系统，其中所述手持监测器包括集成血糖仪。 37. The system according to claim 1, wherein said hand-held monitor comprises an integrated blood glucose meter. 38. 如权利要求1所述的系统，其中所述发射机将所述相应的葡萄糖值无线地发送到所述手持监测器。 38. The system according to claim 1, wherein the transmitter to the respective glucose value wirelessly transmitted to the hand-held monitor. 39. 如权利要求1所述的系统，还包括胰岛素栗。 39. The system according to claim 1, further comprising insulin Li. 40. 如权利要求39所述的系统，其中所述发射机将所述相应的葡萄糖值无线地发送到所述胰岛素栗。 40. The system according to claim 39, wherein said wireless transmitter to transmit the glucose value corresponding to the insulin Li. 41. 如权利要求40所述的系统，其中所述葡萄糖监测系统是闭环系统。 41. The system of claim 40, wherein the glucose monitoring system is a closed loop system.